Race morning was cold, windy and rainy but the location and backdrop more than made up for the weather conditions. Set in front of the historic Kronberg Castle, the ominous weather set the scene for a dark and fierce European Championship. The women were allowed to jump into the water after the mens race started - 3minutes before our race start. Take away the time to pee in my wetsuit and the minute sculling on the start line, there wasn't much of a 'warm up'. The course was one of the best swim courses I’ve done. It was a tight and twisty course with turns every one or two hundred meters. The entire 1.9k swim was inside the boat harbour making for an awesome spectator-friendly swim. The windy conditions made the water surprisingly choppy considering you'd expect it to be protected in the harbour. Even though I'd studied the "drunken child's crayon drawing swim course" as Paul Kaye described it, several times before the race I still had to stop a couple of times to double check I was heading for the right turn buoys. Out of the water in second place, I heard I was about 2:45 behind Helle, which was about what I'd expected. The run from swim exit to bike was a loooong way. Half way to our bikes we got to have a sit down though (if you chose to) on the benches at our transition bags. I quickly found my goodies, replaced my helmet with wetsuit and hung my bag back up before I continued on the long journey to bike transition. Out the back of Elsinore, around the grassy field, by Kronberg castle, past the little remote pebble beach, and then finally into the back of the bike transition compound. Once in the compound, it was only another couple hundred meters to my bike and I was finally on my way to the scenic bike ride through the Danish country roads. The bike course started out heading North along the coastline, reasonably flat for the first half hour before we headed inland through some awesome rolling hills and tight windy roads. The roads were wet and it was lightly drizzling so I tried to ride a little more cautious than usual especially after I nearly overshot the first tight corner. That sign saying "get off your aero bars" was legit! Then a little later on I'd taken my eyes off the road for a second and found myself in the gravel on the side of the road and had to make the decision of when to safely bunny hop back up onto the road. The bike course was enjoyable. It was interesting scenery, challenging terrain up and down short punchy hills, and constantly changing direction. Never a dull moment. At 50k I heard a split that I was still 2min behind Helle. I was surprised that I hadn’t made much ground back on her yet so I began to push the pace for the final 40k. Over the next 20k I got more and more splits yelled out at me as we came back into town to begin our second shorter bike loop. This was helpful and relieving to hear the splits coming down through 1.30min, to 1min, to 30sec. With about 3-4k to go, I was happy to get a visual on Helle up ahead. I continued pushing passed to take the opportunity to get a jump on T2. It was a quick last couple k’s as we winded back down into town. 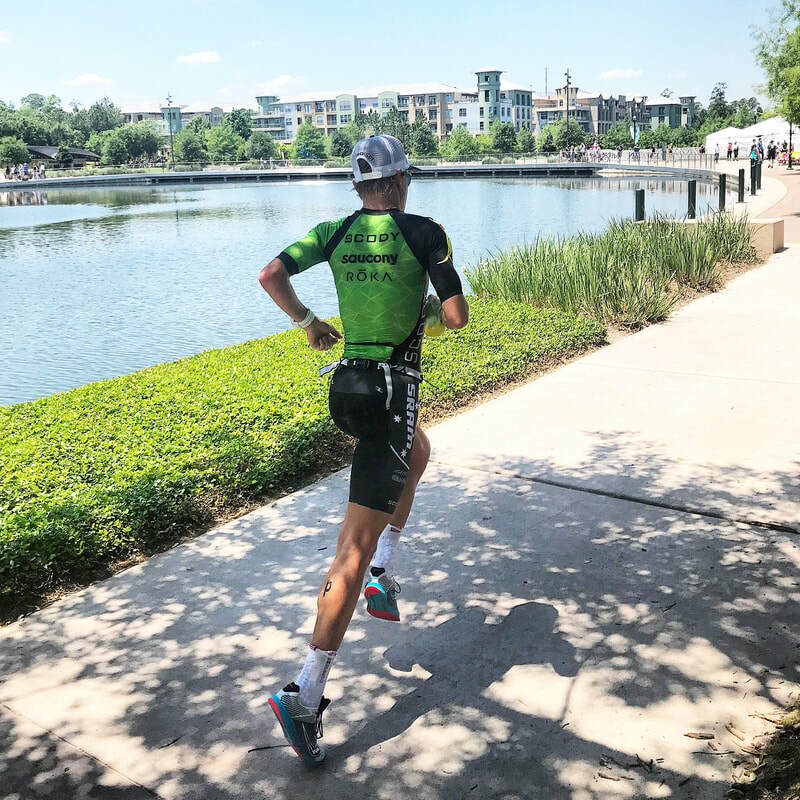 T2 had bike catches which was a nice change for a 70.3 and meant I didn’t have to dirty my socks any more running a mile around transition in the grass and dirt. Straight to the transition bags, change to run shoes, I was out on to the run course. It started with a lap around Kronberg Castle. Crushed gravel trails, tight turns, weaving in and around the old castle walls. From there the run course took a series of snaking turns all through the old down town streets. Cobble stones and old buildings, heaps of spectators, even people cheering from tiny windows high above the streets. I never knew where I was on the course as we winded up, down, in and around but it made it go by pretty quickly. 3.5 laps made the course heavily congested on the last couple laps so I got some good side stepping practice (since it's Soccer World Cup time and all) but all-in-all still a very enjoyable course. The weather had cleared up by the end with the sun starting to shine through. The last couple of km's finished with one last trip around the castle before heading into the finish. By now the course was so packed I had to signal to the age groupers I was turning off... " this is my turn" as I put my left arm out to indicate I was heading for the finish chute while they continued straight on. I ran down the red carpet to grab the winners banner. I was stoked to win my third European Championship. 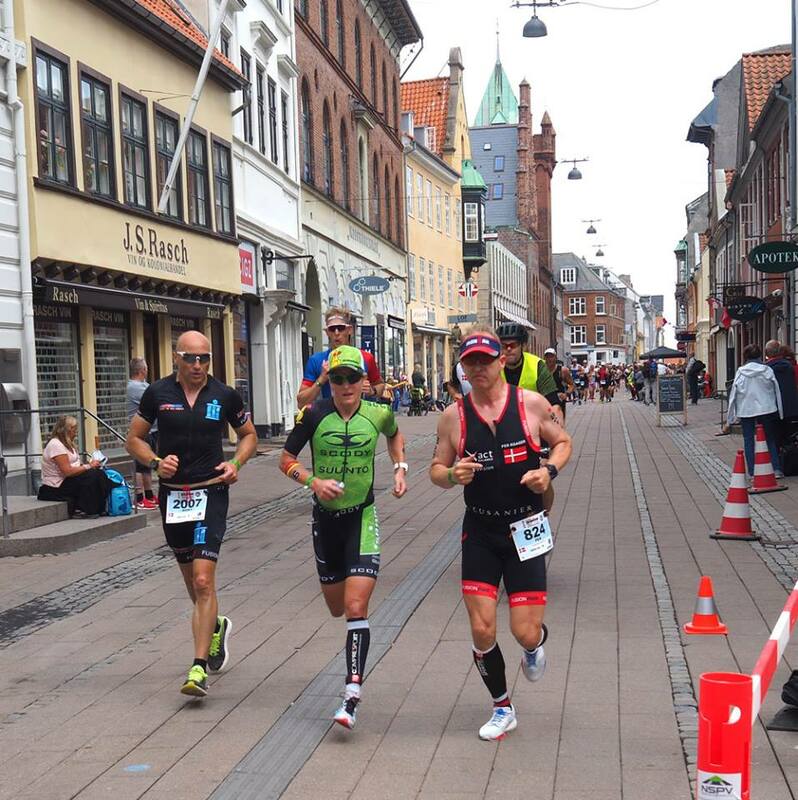 Denmark put on a great event on an awesome course and I hope to be back again some day. Now that my last hard brick session is done, I can put my feet up and recover for Ironman Nice in 7 days times. I might have to put some Texas longhorns on the front of my bike to show my allegiance to Texas after the month I had there. It was an absolute blast. I met so many wonderful, hospitable and gracious Texans. I got to spend a month in the perfect training location with my awesome friends Roberto & Jeannine and to cap it off I came away with 'The Texas Double'. 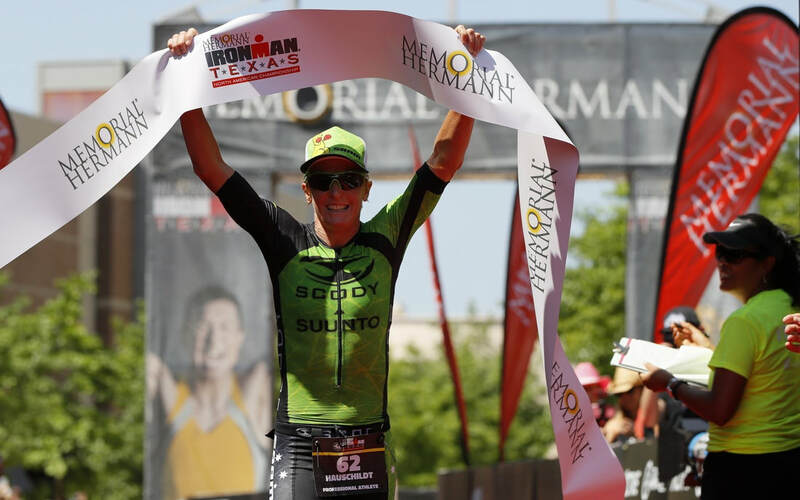 The win in both the Ironman 70.3 Texas and Ironman Texas - North American Championships. With this win, I've managed to keep my 9-year streak alive. 9 consecutive years of winning at least one championship race per year (World, Regional or National). Compared to the wintery weather during most of my month in Texas, the weather on IM Texas weekend was absolutely stunning. You couldn't have asked for better. Crisp in the morning, mild warm temps through the day, clear blue skies and not a breath of wind. The water temp, however was right between the pro and age group wetsuit cut-offs. This meant pro women starting the swim at 6:30 without wetsuits and age group males starting at 6:40 WITH wetsuits. I've had one other race where this was allowed to happen, in Frankfurt, and it sets the women up for a ridiculously unfair bike leg. The gun went off at 6:30 sharp, just as the sun was starting to burst up from behind the horizon. I expected that I'd feel pretty sluggish in the fresh water without my Roka security blanket (aka wetsuit) to keep me floating. But we got going and the swim was actually quite enjoyable. 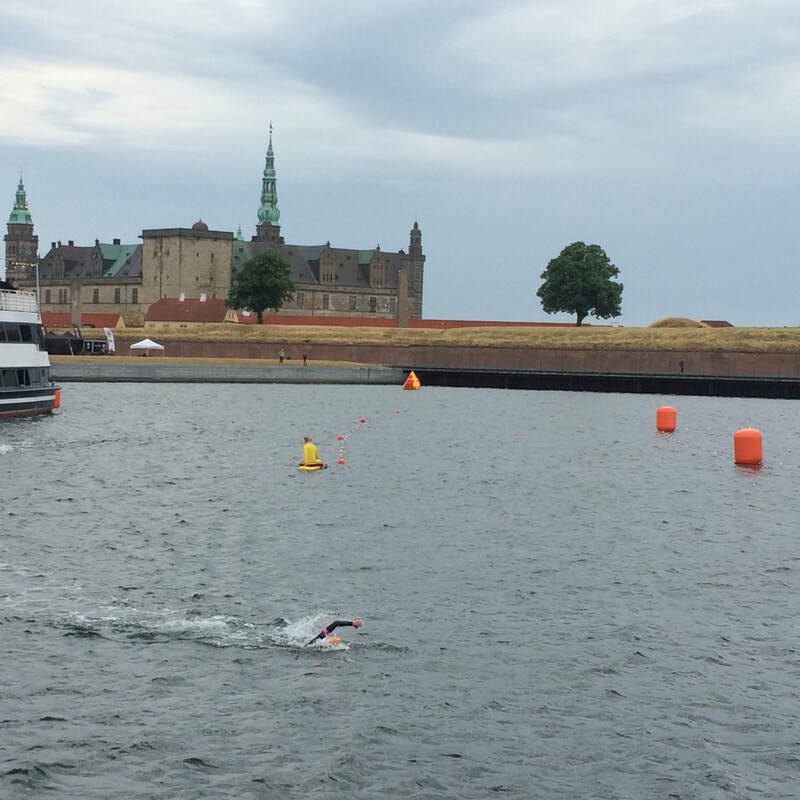 The second half of the swim, the course turned to head down through these narrow, winding canals. It was the first swim I’ve done where spectators can line either side of the canal and cheer within meters of the swimmers. It was awesome. 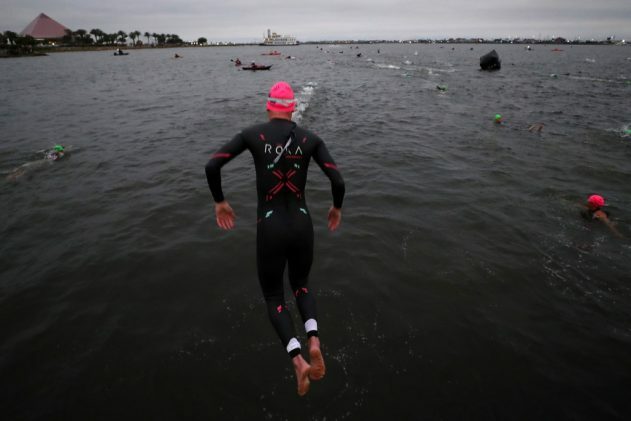 I've always felt that the swim leg feels so isolated from the world, like it's not really part of the race. But this race was different. It seemed a bit more interactive if that's possible with a swim. Lauren Brandon got straight to work on us all, she did what she does best, fired up her secret underwater jets and left us for dead. I think she was through T1 and onto her bike while I was still humming the pre-race American anthem a few strokes into the swim leg. She finished the swim in 48:19. A minute faster than the pro men. Meredith was next, 5min ahead of me and then there was a group 2-3min ahead of me. I exited the water in 8th feeling in control and ready for the race to begin. The bike leg was two laps, out-and-back along a dead flat stretch of highway. The first quarter was a peaceful journey for me. No cars, bikes, people, noises. Not even houses or streets. Just me travelling along a big closed-down highway like as if a virus had spread though the city and wiped everyone out. Eerie silence. 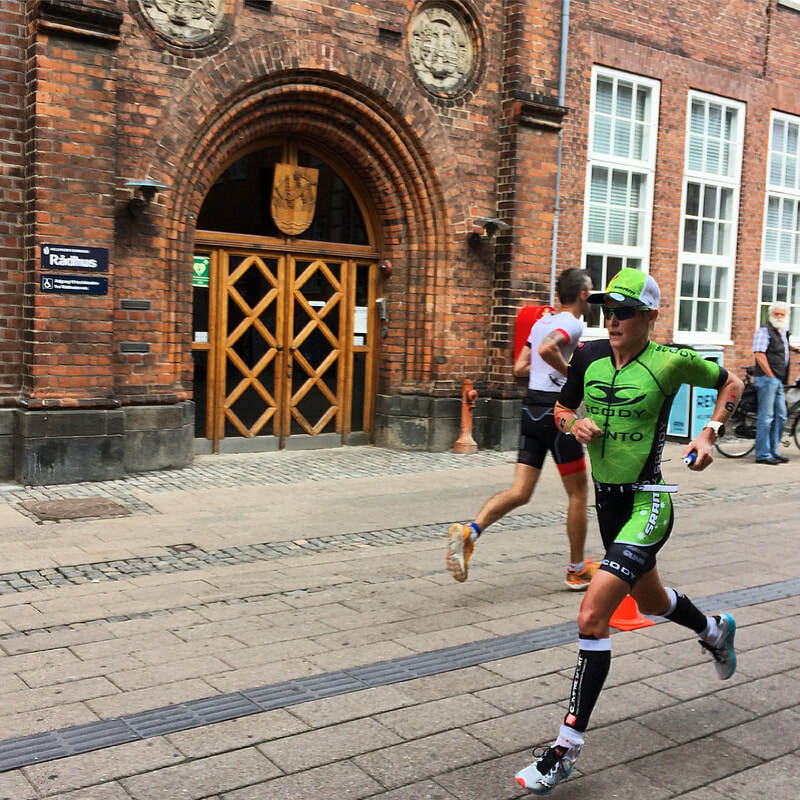 The pace felt good, under control, how the first half of an ironman should apparently feel. 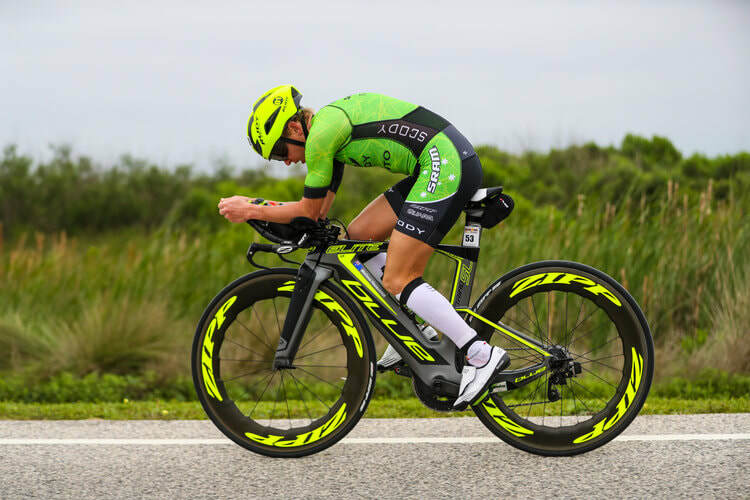 I expected this race to be like most of my others, put my head down, ride the bike leg solo, chasing down the uber swimmers, passing a few athletes here and there till I get to T2 as close to the front of the field as possible. That's my go-to race plan. That wasn't how this one played out though. This one played out a bit more like Ironman Frankfurt. Some pro men interfered at some point along the way and then eventually age group men became a significant factor in the womens race. Through the second half of the bike leg any previous goals I had of continuing to push ahead in my race were obstructed by people on the course interfering. For me, any group dynamics at all is a foreign scenario on the bike, let alone when it includes males with a completely different set of rules. The race from that point became a frustrating tussle. Trying to spike my watts to get around everyone and continue on with my own race... and the deflating feeling of having age group men slip steam (they are legally allowed to draft for 25sec at a time) up behind me, sling shot around, leaving me to have to sit up and make an effort to get out of his 12m zone. Of course as soon as I do this, the next one sling shots around, and again and again. Frankfurt was about a thousand times worse. But both races leave no room for women to fairly race each other. At this point the womens race gets put on hold, the safety car comes out and brings the field back together until they're free to race again a couple hours later. For the second half of the bike, I remained in a constant state of emotional turmoil knowing I'd trained months for this day, paid a fortune for flights half way around the world, got everything as perfect as I could in the lead-up... for it all to be wasted as the race for woman against woman slips away with no way to avoid it. My mind flipped like a Schizophrenic from anger, sadness, despair to 'here's my chance go hard, harder, keep going' and back to despair. 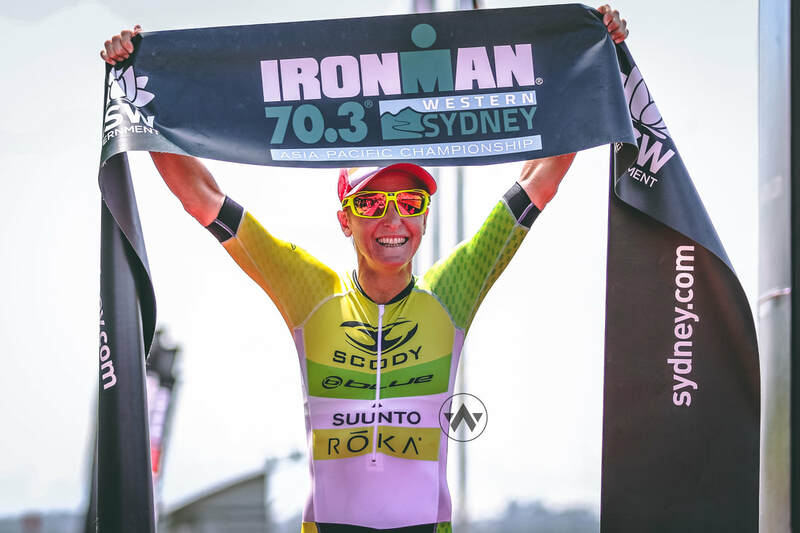 I can't get a reasonable answer as to why the women are not provided a fair race in Ironman. The most common (but laughably unreasonable) answer I get is the age group men cannot start 10 or 20mins later because it would effect their midnight cut-off time... 17hrs and 20mins later. I rolled into T2 with Meredith, Michelle and Jodie. Kimberly, Lauren and Jen were ahead, out on the run course already. 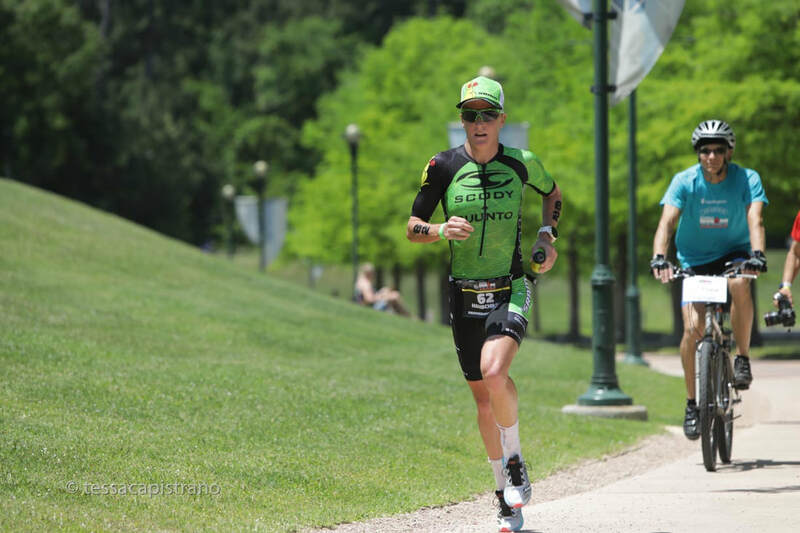 By the time we made our way through T2 I was onto the run course in 4th place about 5min off the lead. I felt great running and it was difficult to run “slow” enough. I imagine that's a common problem for most during the marathon. Tapering and adrenaline do amazing things. Plus racing a half just three weeks prior makes IM pace feel even slower (at least at the start till it eventually grinds you down). I was ticking off 4min km’s on the flat concrete paths around The Woodlands. I took the lead before the end of lap 1, on a three lap spectator filled, scenic course. I felt confident on the run. 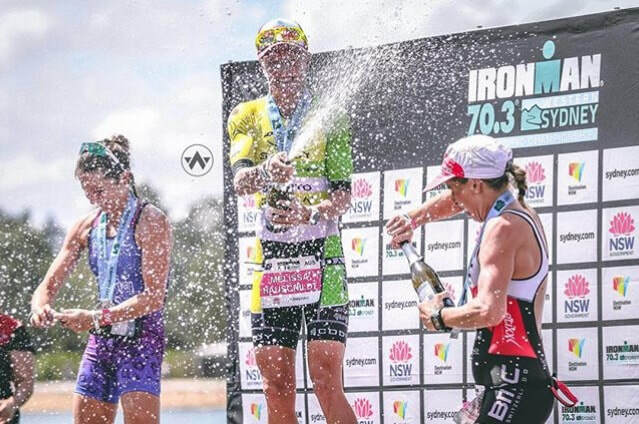 I’d done a few good weeks training back in Australia before Texas 70.3, but there was one thing bothering me. My feet were burning up under my 3rd metatarsal. At 5km they were sore. By half way they were giving me notice that this was going to be a long painful run. By 32km they were screaming out for me to stop. Every step was like running on glass. I had over 10min lead so I decided to take a toilet stop and put my feet up. As I sat in the smelly, hot porta loo I put my feet up and told myself that it was just 10km of running to go, forget that I've already run 32. As I jumped back on the course it was worse than before. Maybe stopping was a bad idea. But I did need to go to the loo so it wasn’t a complete waste of time. The next 10km I stopped checking the splits on the Suunto and just nursed my feet one step at a time. I was trying as hard as I could to heel strike to keep off my forefoot, but jeez heel striking is tough. And tiring. Finally, I saw the finish line. I wished just for the last 100m that the pain in my feet could have gone away cos I’d dreamt of this sight for the past three weeks and how enjoyable it'd be cross the line first. But all I could think about was getting my shoes off and throwing my feet in a bucket of ice. My body felt good but my feet were in a world of pain. I had mixed emotions after the race. I was stoked at how fit and heathy I was but I was annoyed that I still haven’t quite figured out my dropped metatarsal issue. I'll have to keep practicing to figure it out. Jared, myself and our homestay Jamie. I'd like to give a massive thanks to all my incredible sponsors who continue to ride the ups and downs with me. A big thanks to my homestay family in Houston, Jamie, BJ & Cooper who were an amazing help and made my weekend run as smoothly as possible. Sorry Jared for yelling “my feet are **** killing me” every time I passed before continuing on with my emotionless-block-the-pain facial expression. And finally thank you to the hundreds of awesome spectators and friends I had out on course cheering my name. It's true, the Texans really are some of the friendliest people around. I arrived in Galveston on Wednesday, leaving home some 30 hours earlier. Also on Wednesday. 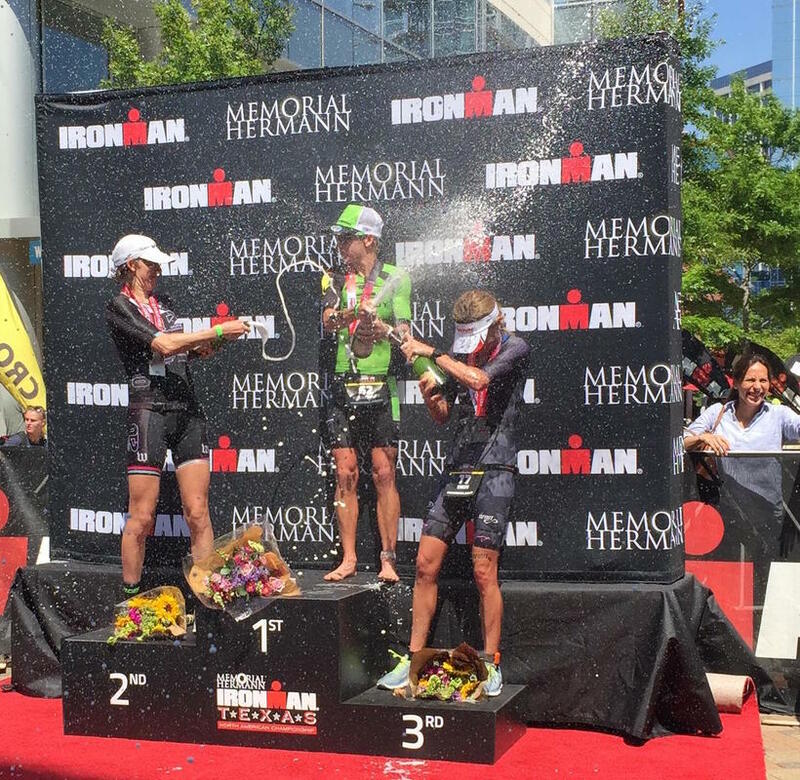 Coming from our hot and humid summer I chose Texas as my first US race to make sure I had nice warm conditions. The first couple days were a bit chilly but pleasant enough. However at some point around lunch time on Friday, somebody flicked a switch and the temperature dropped from 20C to about -120C. Ok, maybe more like 5-10C, but once you're in single digits, accompanied by 40kph winds and rain, it might as well be a 100 below. The cold weather stayed right through to race day. It was freezing. The day before the race, officials advised us it would a non-wetsuit swim. That guy making the call probably just flew in from Iceland, so who could blame him. But luckily on race morning, a regular human retested conditions and changed it to a wetsuit-legal swim. Phew. I was picturing last years IM Frankfurt conditions all over again in my head. I stood on the jetty in my wetty and socks, the wind cutting right through my Roka suit, my hands and feet numb, getting that semi-comfortable sleepy feeling people talk about before they die of hypothermia. I looked down at the water (while the event volunteers diligently chipped away at the layer of ice on top), praying it'd be warmer in than out. The time finally came to jump in. I stepped out of my socks, leaving them stuck frozen to the timber boards, and made the plunge into the water. It jolted my fading brain function straight back to reality and I was pleasantly surprised, the water temp wasn't too bad. My arms and neck were tense from the shivering and I was struggling to find motivation to warm up properly, but for a moment I had a slight relief that I just might possibly make it through the day. Race start was now 1 minute away. As I sculled on the start line I finally got a flicker of that excited/nervous feeling you get leading into a race. Unusually late to get that sensation kick in for me. Better late than never. When the gun went off I started out without any serious flurry. My starts are usually a frantic thrashing of arms and legs to will myself to keep up with the field. Usually it has the opposite effect and it's where I typically lose most my time in the swim leg. Today however, I kept relaxed and took it easy at the start. Maybe because I was in a different frame of mind pre-race today. I'm not sure why, but there was no urgency. After about a minute I was still getting kicked and beaten up. Most of the girls are usually long gone up ahead by now. I was stoked to get a little thump here and there. About 400m into the race I was still in the group. That gave me confidence. This swim was turning out pretty good so far, and yet I'm not really fully invested in swimming hard this morning. Interesting. By the end of the swim I was still in the main pack and I was happy with how it went. Relaxed, no stress, the opposite to most of my swims. I exited the water with Rinny right behind. We're usually pretty close out of the water. I wondered if she was as happy with her swim too. I thought of giving her a high-five running up the ramp out of the water, "look at us go Rinny, we're in the main pack". The leader was 3mins ahead and there were two others 2min ahead of our group. Most of our group were pretty quick to get on their bikes and clear out of T1. I took the time to put socks on and I had planned to put on a vest but no-one else did and I was warm after the swim so I left it behind thinking they all knew what they were doing. As soon as I jumped on my bike I felt the freezing wind and wished I'd taken the time to put that vest on. Heather and Rinny were just up ahead now and seemed to be taking it easy, winding out onto the main section of the course. I stayed back thinking I should build into it once I get some warm blood in my legs. It turns out I don't think it would've mattered at all. It was freezing and I was feeling it. My quads were frozen, my fingers were numb, it felt like I had ice down my chest, deep in my lungs, and I had that brain freeze with the cold wind getting up under my helmet. Once we were out onto the main highway, the course was 40k straight, flat, following the coastline, with a big tail wind. You never know it's a big tailwind till you turn around. As the k's ticked down, my core temp did too. There was never a point where I thought I was starting to warm up. Shivering and tensing up I knew I'd be burning more calories than normal so I tried getting nutrition in. The first 20k I was able to get some liquid calories in, but after that my fingers were useless. I would've had as much luck trying to pull the bottle out of the frame with my foot - in cleats. At 45k we turned around and headed straight back. Gail force. Icy. Tunnel vision. Arctic suffering. I'd always pictured Texas as hot. Not today. Except maybe for that guy visiting from Iceland. I eventually rolled back in to T2 after being out in the elements way too long. Kim was now 3mins up the road, Heather was right behind me and Rinny was about a min back. I didn't know how I'd feel getting off the bike with everything so numb. And I didn't know how I'd tolerate the lack of nutrition, knowing I would've burnt extra calories from shivering. I figured at least I'd get the jump on Heather in transition as I already had my socks on from T1. Unfortunately my fingers still had the dexterity of a hoof. Have you ever seen a horse undo a helmet clasp. No. Me neither. I ran over to the nearest volunteer for help. Of course my lips and face didn't work either as they were frozen. Luckily this volunteer must work with special people like me all the time. She knew what I needed and she made it happen. I owe a big thank you to that volunteer, without her, my Plan B was to run 21k with my helmet on. I guess that might've got me a little more media attention. As you'd expect, getting running shoes on was a mission too. My fingers were no help so I just kept jamming my foot into the shoe until it looked like it was kinda on. At least my eyes were working. I couldn't tell you if it 'felt' like it was on. The first 3k I still wasn't 100% convinced I had my shoes on the right feet. It just didn't feel right with the numb stubs attached the end of my legs. I eventually caught back up to Heather and tucked in behind her 6-foot-11 frame until I thawed out. After 3k, I started to feel more normal again. Blood was returning to all the extremities and I started to feel good so I made the pass to move into second place. The run course was really enjoyable. It was three laps winding in and around the water park with several hairpin turns. You could regularly see your competitors, there were spectators all over the entire course and there was no long straight stretches so it kept it interesting. I felt really good running. Possibly because I was returning to life after my earlier 'out-of-body-cryotherapy experience'. I passed Kim around 10k to take the lead. Heather and Rinny looked to be running strong behind me so I couldn't back it off. I was extending my lead every time I saw them but not because they were slowing down at all. They looked good. It wasn't until 1.5k to go that I knew I should win it from here. 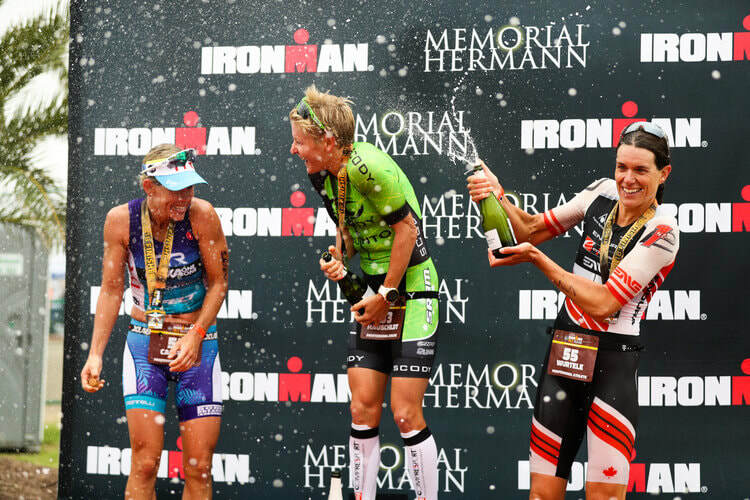 I was able to shut it down a little, take it all in and enjoy the excitement of the last k.
I was stoked to take the win against a strong field of women and in conditions that really hurt me most. I didn't die. Well, actually it's hard to say for few brief periods there I'm not entirely sure. 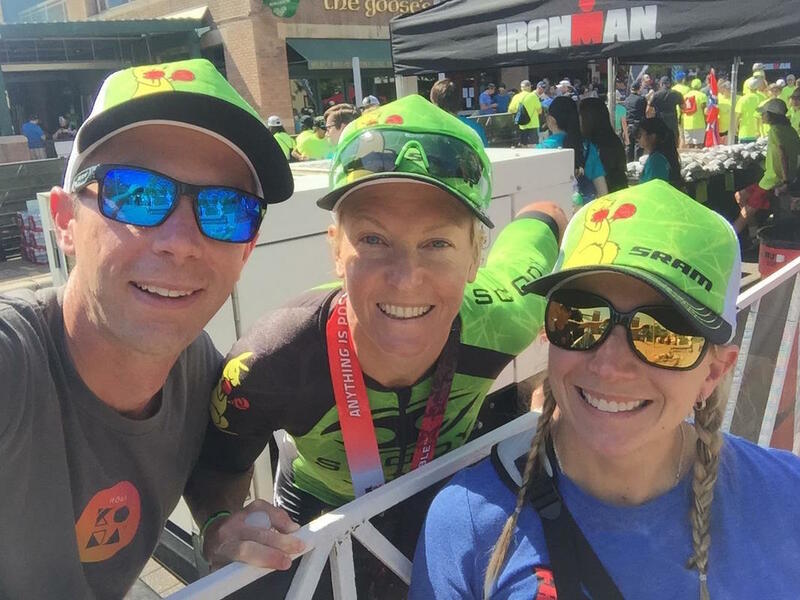 But as they say, what doesn't kill you... Congrats and thank you to Rinny and Heather for the top-quality racing. And congrats also to Kim for hanging tough, finishing 4th, after a smoking bike leg. The only thing I saw smoking in that weather. 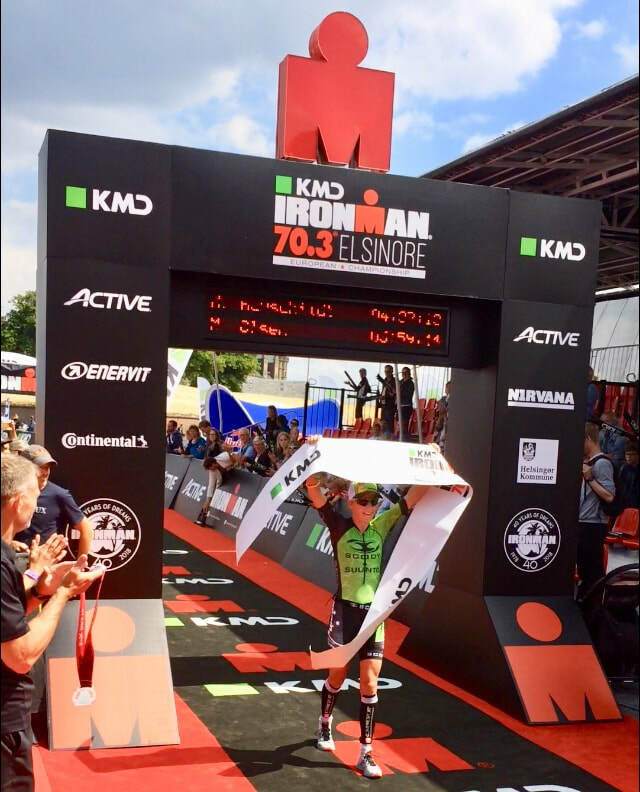 A big thank you to Ironman for looking after me during this race and a the biggest thank you goes to my good friends Roberto & Jeannine for running me all over the place and welcoming me in to their home for a few weeks while I prepare for the full Ironman coming up soon in Texas. I haven't raced in New Zealand since Jan 2014. 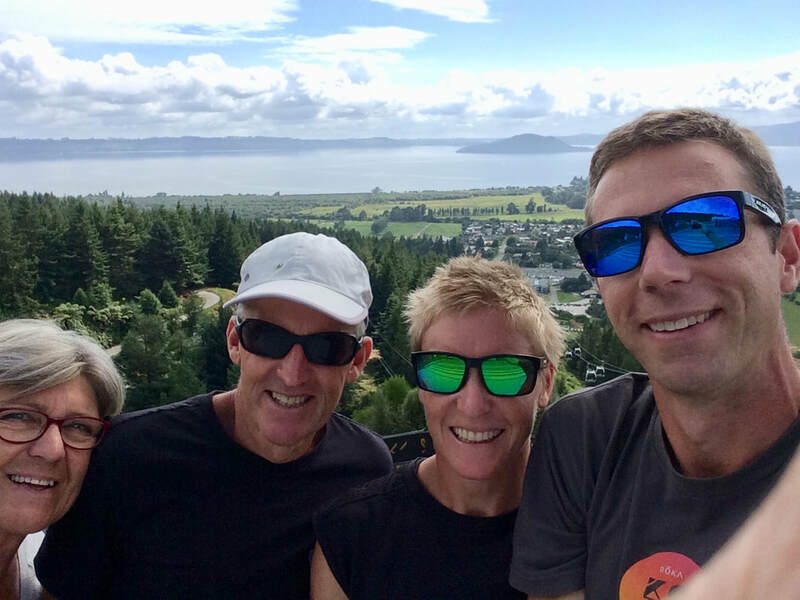 Actually that was my one and only triathlon race in NZ and I haven't been back till now. Why? Cos I did a few acrobatic flips off my bike that day back in 2014, landed on my head and ended up in hospital. That put me off heading over the ditch for many years but this weekend I finally conquered my fear and lined up for the 29th running of the Port of Tauranga Half. New Zealand is beautiful in so many ways and this race did not disappoint. Of course, it always makes things even better when you come away with a win to cap it off. 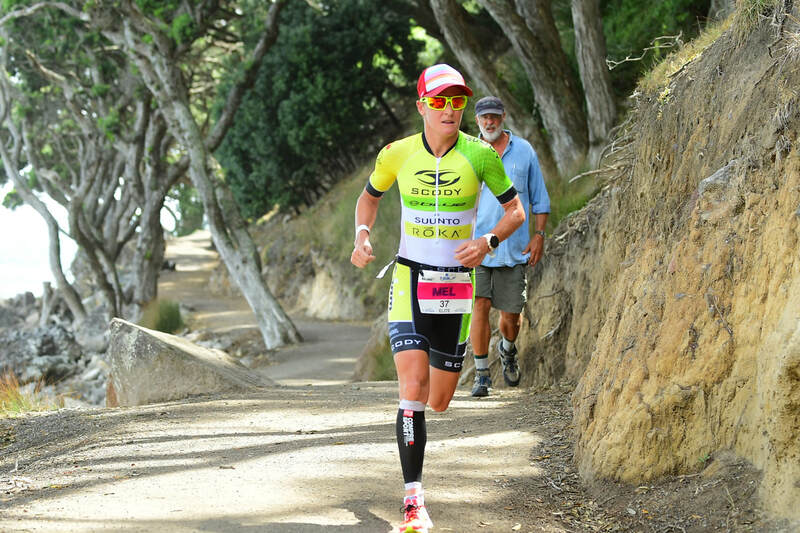 The race is held at Mount Maunganui as part of a multi-day, multi-sport festival packed full of different events. The little town is the perfect little touristy getaway with the main street of buzzing cafes and restaurants flanked by the ocean on one side and the calm waters of Pilot Bay on the other. At the very end of the peninsula sits the Mount like a trophy piece positioned at the perfect point for all to see. The 2km swim is in the bay side so it was very calm and flat. I was up against some uber swimmers who put daylight into me and the rest of the field but I was pretty happy with my swim exiting the water in 6th place just 23 seconds behind Amelia Watkinson (last years winner) who put almost 3minutes into me after the swim leg in Western Sydney just a couple months ago. 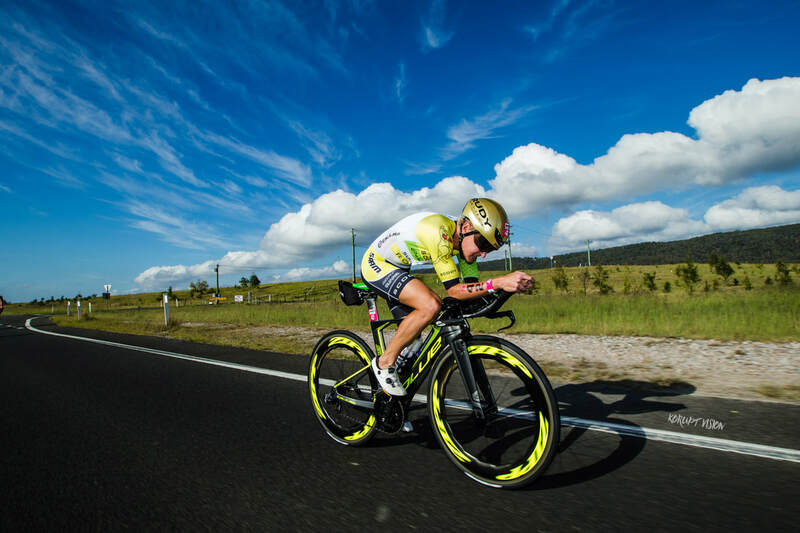 Just before leaving Australia I put bright yellow Zipp decals onto my Disc wheel. Just a heads up, yellow is faster and combine that with a super 9 Zipp disc, I was out of control on my bike. I tackled a truck, ran up the backside of the official moto when he got caught up in traffic and pulled out in front of me, drifted sideways around a corner and slid into a parked van, dodged several cars as they got caught up in the age group race and I took a detour onto the highway to Auckland when trying to navigate the course at high speed. In hindsight, this is a course that you should know well prior to racing unless you have someone to follow. I did eventually make it back to town in one piece and in the lead with the fastest bike split of 2:15:50. Out on the run course I was stoked to hear so many people calling my name. Did they all know me? Or was it because I'd handwritten MEL in big block letter on my race bib. That's probably it. I felt good running and had a good lead so I knew I could "enjoy" it. My Homestay hosts were out on course watching so it was a highlight to see them two times each lap. After an out and back section on the road alongside the beach we then had to tackle "The Mount". My lead cyclist pulled off before The Mount so I had a feeling it was about to get exciting. I'd just passed the last aid station before seeing Mount Maunganui but then saw two options - stairs or ramp. I took the ramp. It was longer than the stairs but who wants to run stairs 7km into the run of a half ironman?!? Running around the mount was nice and shady with the beautiful ocean on your right. This made it a little less painful as I tackled the undulating dirt trail. But then I hit the REAL stairs! These weren't just stairs. They were STAIRS! I powered up the first few, jogged up the next few, then... can you still call it a run if you put a bounce in your step? Either those stairs majorly grew in size towards the end or I shrunk cos I was about to start using my hands to climb up those gigantic steps. I looked like my 6month-old nephew trying to climb up stairs. Lap one down and back into the thick of the crowd. All the awesome spectators definitely recharged me after my stair climb. The second lap I had really extended my lead and surprisingly felt even better second time around. Maybe it was because there were more people on course with the age groupers now starting their first lap. It became a little more congested at aid stations as we had to share the station with competitors heading in both directions. It made for some surging and slowing but I managed to get in enough fluids and eye off all the Moro bars they had to offer. Running down the finish chute I was happy to get another win under my belt and feel really strong doing it. 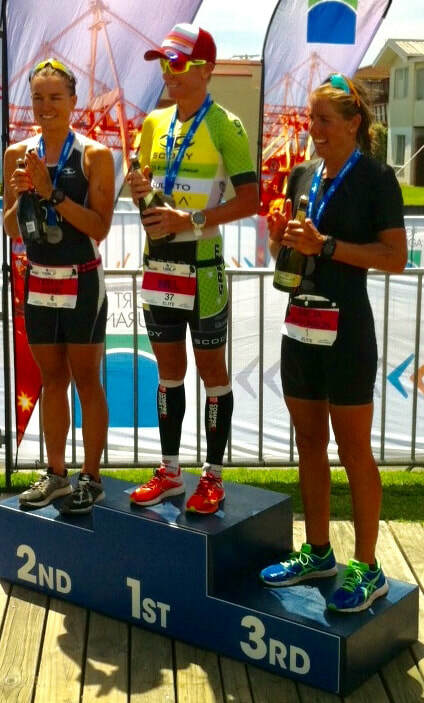 Congrats to local New Zealanders Teresa Adams and Amelia on second and third placings. Big thanks to the event staff for an amazing experience. I'm glad I made the trip over and look forward to coming back again in the future. Also a huge thank you to my amazing Homestay hosts Denise and Gerald. They were so kind to take in my husband and I for the weekend, give us a bed, run us around, and provide a relaxed and happy environment for us. They even showed us an awesome whirlwind tour of Rotorua for a jam-packed, fun-filled Sunday morning before we had to be back at the airport. Where's Mick Fanning when you need him? 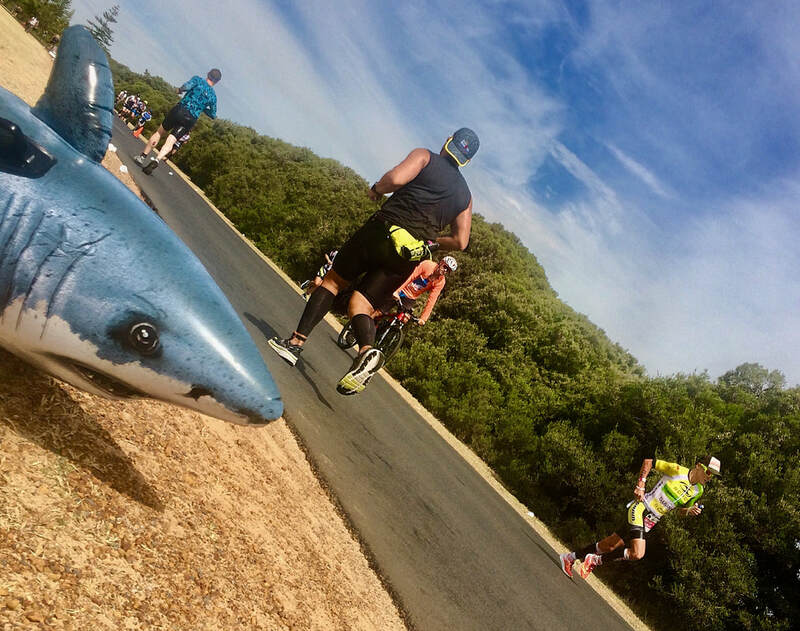 Clearly the sharks in Busso did not get the message to buzz off this weekend. And what about the kangaroos tackling a couple of internationals off their bikes, C'mon Roo's, that's not how we treat our guests. And then the bush fire that started due to the sweltering Aussie heat! Welcome to Straya - what doesn't kill you makes you stronger! So when the announcement was made that the swim was cancelled due to the shark I was frustrated and briefly lost motivation as I was so pumped and ready to break my course record from last year. 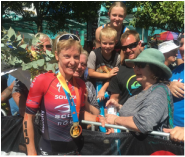 I had it all worked out... What times I needed to swim, bike and run and I was confident I could break the record. Why couldn't they just keep us closer to shore instead of going 2k straight out into the feeding zone, I thought. I was too focused on breaking the record to think clearly and realize now that keeping all my limbs is a little more important than chasing records. Ironman did a great job at quickly deciding on an alternate plan. So that was it, we had a duathlon starting off with a 180km time trial heading off 20 seconds apart. As I was number one seed I started last. This would usually be no different to how I'm usually positioned at the start of the bike leg, but this race was made up predominantly of uber bike-runners anyway. 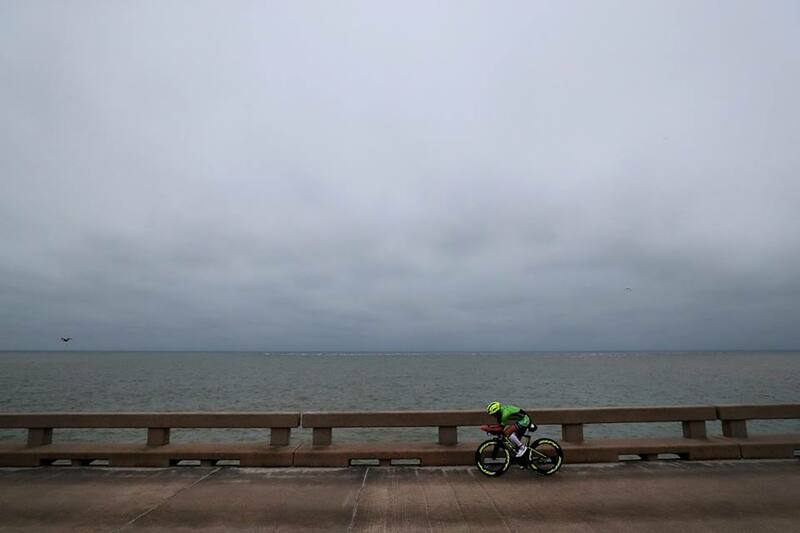 After all the pro's had left the beach and got on their bikes, I was the last lonely one waiting for my start. I ran from the beach up the stairs and over the bridge, into T1, grabbed my helmet and socks out of my bag and quickly made my way to my bike. Mareen, who started 20 seconds ahead of me was just leaving T1 by then. When I mounted my bike I had caught her within seconds and went straight past. My plan was to sprint through T1 to get my heart rate up as it would be if we'd just swum 3.8km. It was hard to control myself at the start. I felt so fresh and just wanted to hammer it but I held back and kept reminding myself it was still a long day ahead. The bike course had six out and back turns on each of the two laps so you could see your competitors many times through the race. I was making up ground on everyone except Carrie. Carrie started 1minute ahead and seemed to be pulling away. After racing a 70.3 last weekend it felt so slow to ride at Ironman pace but I had to stick to my plan. Carrie was going to have an absolute blinder out front if she kept up that pace. After lap one I had moved into 2nd place and Carrie's lead had built to a couple minutes. As soon as we started the 2nd lap I finally started to make time back on her. By 140km I'd caught and made the pass, which also meant I essentially had a minute lead on her accounting for the different start times. It was not long after I'd made the pass though that the heat really started to take its toll. The aid stations seemed so far apart and I couldn't get enough water in. I'd grab a bottle and scull the entire thing before the end of the aid station. Forever wanting more. It gave me a little comfort knowing I must not have been the only one suffering as Carrie hadn't come back to pass me and Mareen and Yvonne had dropped right off by then. I got to T2 first with a new bike course record of 4:37:42. The heat was now cranking. I sat down in T2 and thought I took my time but I obviously rushed through faster than I thought as I totally forgot to take my nutrition with me. I upended my bag and all sorts of goodies fell out. Socks - I already had some on from T1, calf sleeves - already started with them on, watch, race belt, sunnies, hat. All of which I grabbed but somehow I didn't even see my nutrition flask. I ran out and it was less than 100m before I realized I'd forgotten it. Jared just happened to be at that point too so I yelled to him "should I go back?". He yelled back "get it at special needs" so I continued on knowing I had two gel flasks in special needs a few k's up the road. But I would have to end up three gels short in the end with out the T2 flask. When it released I hobbled off trying to reduce my leg flick-back to prevent using my hammys to much. I only got a few more km before it really started to come on again. It was on the out and back section and I knew Carrie who was in second place would be coming the other way any second. I tried to hold out till she ran past but I couldn't. It got me, right as we crossed paths. She yelled out to me to keep moving but I couldn't, every time I tried to inch forward the grip would tighten. I was thinking we're lucky it doesn't get this hot in Kona or we'd all suffer big time. A nice man coming up behind me gave me one of his gels which just so happened to be a GU gel - the gels I use and left in T2. I was very grateful for his generosity. Once the cramp passed I was on my way again. I was now on my third of four laps so I knew exactly where every aid station was so instead of counting up the kms I was now counting down the kms till the next aid station. I ran from one to the next downing everything they had. The spectators were amazing and had garden hoses and jugs of water they were throwing over us as we ran past. This also helped to dilute the pain and break up the run. The last 4km was back into the head wind and went on and on. It was about the point where I finally believed I had it in the bag if I just kept putting one foot in front of the other. So close yet so far. I started imagining that finish line. I was picturing a massive bucket of ice water at the end of a red-carpet-water-slide and a giant slurpie to drink. It was so close I could even feel that brain freeze you get when you scull the frozen drink too fast. Finally, I was on the M dot carpet. Pete was calling my name and I knew I was now metres away from being able to throw myself on the ground. I stayed on my feet for the photos then lied down on the carpet and closed my eyes. 7:52:04. I was wrapped with the win and relieved the suffering had come to an end. But at the same time I was a little disappointed that I missed the opportunity to get the record that I'd set my sights on. I was left to only imagine if I had my 54-min swim from the previous year added on I'd be so much more satisfied walking away with 8:46 and achieving both goals I'd set out to achieve. That said, of course I'm even more grateful a shark didn't chew my leg off! 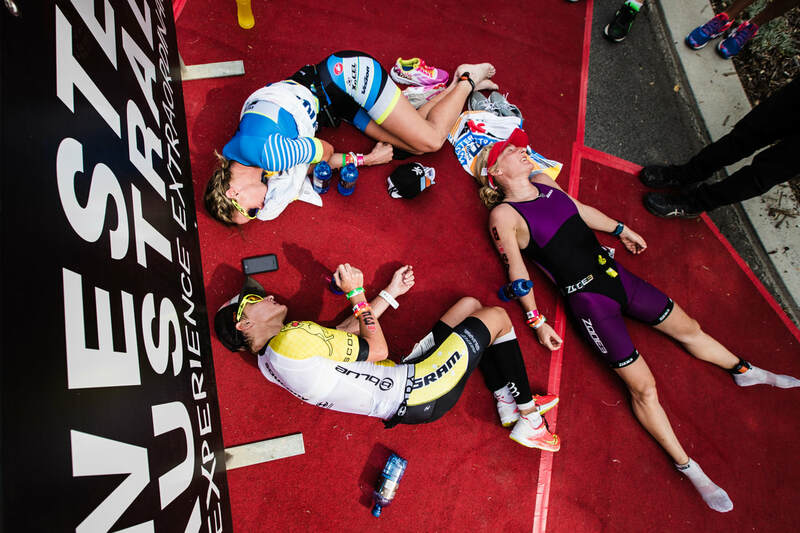 The heat caused some serious carnage out on course. 13 Pro's didn't finish the race. I ran a lot slower than I hoped and what I thought I was capable of, but so did everyone. Only 4 pro's ran under 3:10 (men included). There were some pretty spectacular blow ups! Those conditions were tough. People often talk about Kona being hot. Kona's heat seems more like a walk through the air-conditioned grocery store when compared to some races in Aus and Asia . In a weird twisted way (it's easy to say this now) but I'm kinda glad we got thrown those tough conditions. You can't buy/simulate that sort of pain and suffering in a controlled training environment and it'll only make us stronger for future races. I know I'm not back to full fitness yet but I am heading in the right direction. The more important part for me is that I'm almost back to good health again. Fitness doesn't usually take anymore than a few short months to regain, but restoring good health was the complicated challenge this year following some serious emergency surgeries. After this past fortnight, I'm confident now I can return to my pre-kinked days. I've now reclaimed my IM WA title. I qualified for Kona. I got my second win in as many weeks and feel like I'm just starting to get rolling again. Fit, healthy, injury free, motivated and finally I have two fully functioning legs for the first time in 3 years. 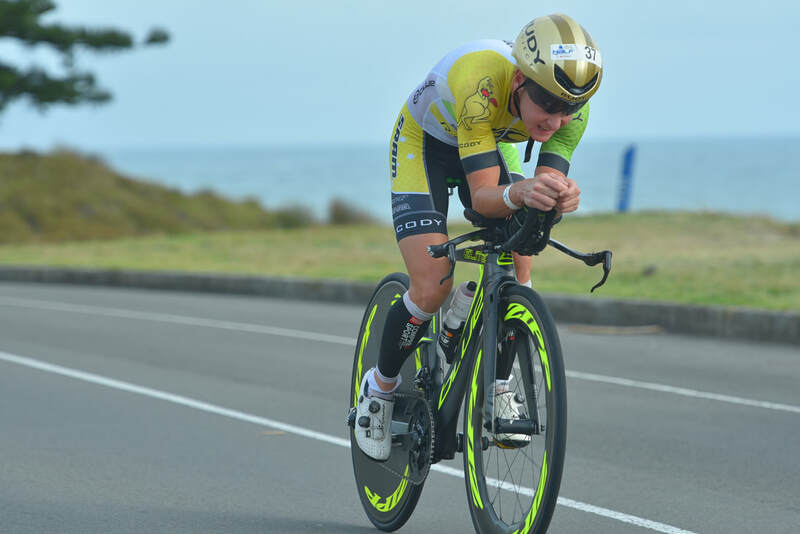 While I was making the most of my time splashing around the Sydney International Regatta, my competitors were on their bikes 5 minutes up the road. It's not everyday you get to swim in the fresh water Olympic Rowing Regatta... What was their hurry? By the time I finally emerged from the swim I realised I'd given myself a decent handicap on my competition. Not the ideal way to begin the bike leg, especially considering the newly-crowned Duathlon World Champ was now a few minutes up the road with the bike/run remaining. 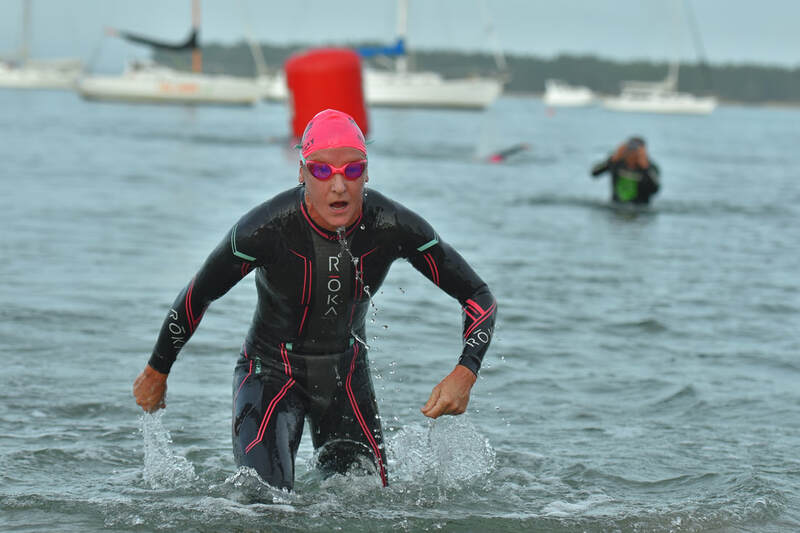 I started to panic and waste more time in transition as I struggled to pull my tri suit up and over my wet arms then got the material caught in the zip and had to fiddle around with it for what seemed like eternity. On two wheels I was now in my comfort zone. Back on solid ground, where I prefer to be. I tore out onto the bike course in an attempt to catch every one of those ladies that decided not to take their time admiring the beautiful body of water as I had. By half way I was 4min behind the leader and just under 2min behind the main pack. I knew I needed to give it a little more gas in the second lap if I were to catch them all. Being my first race back fit and healthy I rode conservative the first lap. I felt great heading out onto the second so I picked it up. Just before 70km I was coming up on the main pack. They had a race referee moto riding next to them blocking the road. I didn't want to yell out and give them a heads up I was coming and a chance to jump on my wheel so I breathed in and squeezed past hoping to catch them all by surprise. Next thing I heard was a quick change of gears so I knew at least one of the girls was attempting to go with me. I pushed it hard to try and get away but then I came up to a sharp left hand turn that was swamped by age groupers. Damn! After I safely and slowly got through the turn I hit it hard again but then a sharp right turn appeared. 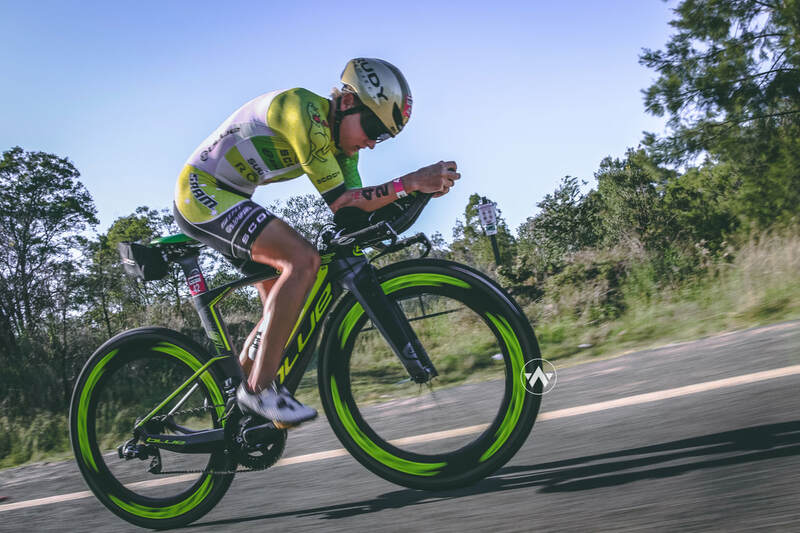 I didn't want to spike my watts again so I just kept it solid, the pace I had been riding and thought if they do want to go with me they might burn up some of their matches for the run anyway. I was on a mission to close in on Lauren, the race leader. The first couple km of the run was out and back so it gave me a good look at where everyone was. I saw Felicity was in 4th place 1:20 behind me. I knew she'd be coming at me fast. I was fairly confident I could run a decent half mara but again, first race back healthy, I didn't want to cook myself too early. I took the lead before 3k from Lauren and ran a pace that I thought would be manageable for the 21k. The lead biker riding behind me had a walkie talkie that was going non stop. It was good for me as I could hear the updates coming through. "Felicity is up into third place" I heard. Then seconds later "Felicity is in second place" then at around 7km I heard "Felicity is only 7seconds behind the leader". She was coming at me fast! I was preparing for an attack to come at some point. She took the lead before 9k and I jumped on. Our next km was 10sec quicker than my previous. But it was still a pace I thought I could hold for the remainder if I needed to. So I settled in and stayed relaxed. I was really happy with how I biked as it earned me a 9k buffer on the run leg. Running with Felicity brought memories of my running days many years ago. It felt like I was in a running race again. 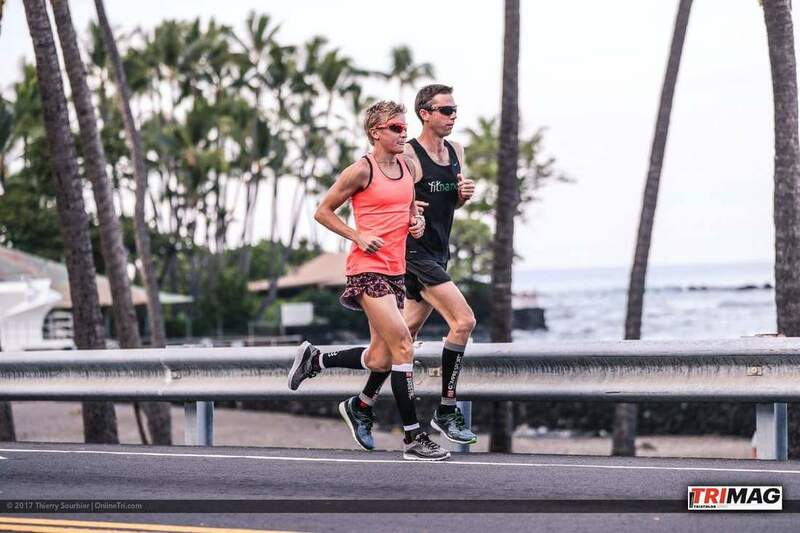 It's not too often I get to run side by side with competitors in 70.3 or Ironman racing. I started to get excited thinking about tactics and pacing and wind directions and sprint finishes. As she set the pace I let my mind wander for a bit and before I knew it we only had 8km to go. I started to think about when to make my move. I decided on 6km to go but then I got distracted and missed the k marker so 5km to go it was. I hit the marker then put on a little surge and quickly opened up a 10second gap. I wasn't sure if that'd be enough so I pushed it for a good couple of kms before relaxing back into a comfortable pace. In the end there was only about 1min 30 separating us. This was my first win for the year after a horrible year of surgeries and heartache. It was such an amazing feeling to cross the line first. More rewarding than many of my other wins because it took so much pain and persistence to get there. Although there was a lot of negativity around my year there was even more positivity. I have been absolutely thrilled to see how many people stuck by me through it all and how sincere and caring they have all been. From friends and family to sponsors and absolute strangers. This year has made me realise again why I do this sport. It's not to get respect from people that only care when I'm winning. It's for me, my husband, my manager and all my true friends, fans and sponsors that really care about ME. 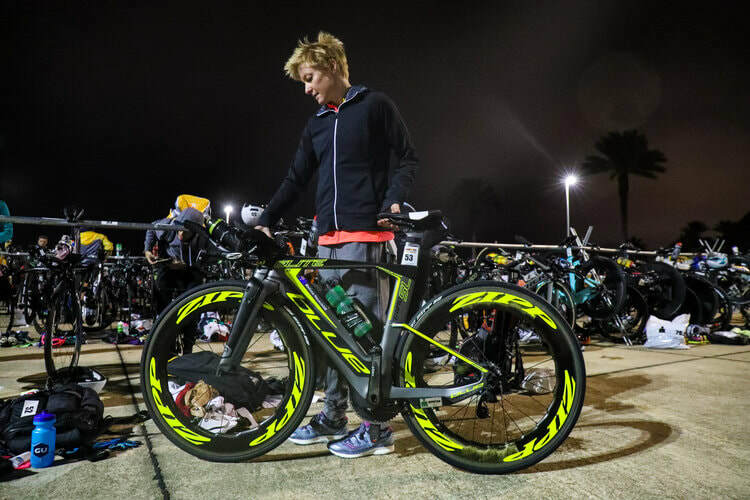 Mel Hauschildt, the person, not Mel Hauschildt, the athlete that wins races here and there! 2017 obstacles - fall down 7 times get up 8. 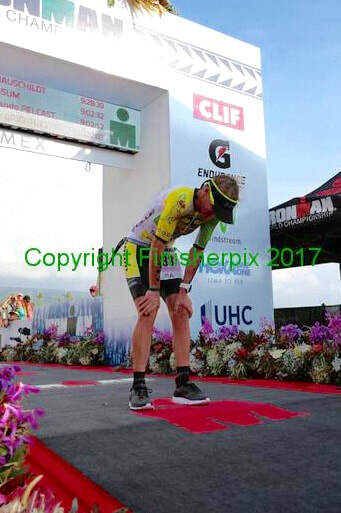 When I was told in March I needed major surgery to fix a kinked common iliac artery which lead to my DNF in Kona last year I was actually excited. Excited to have an answer and a fix! 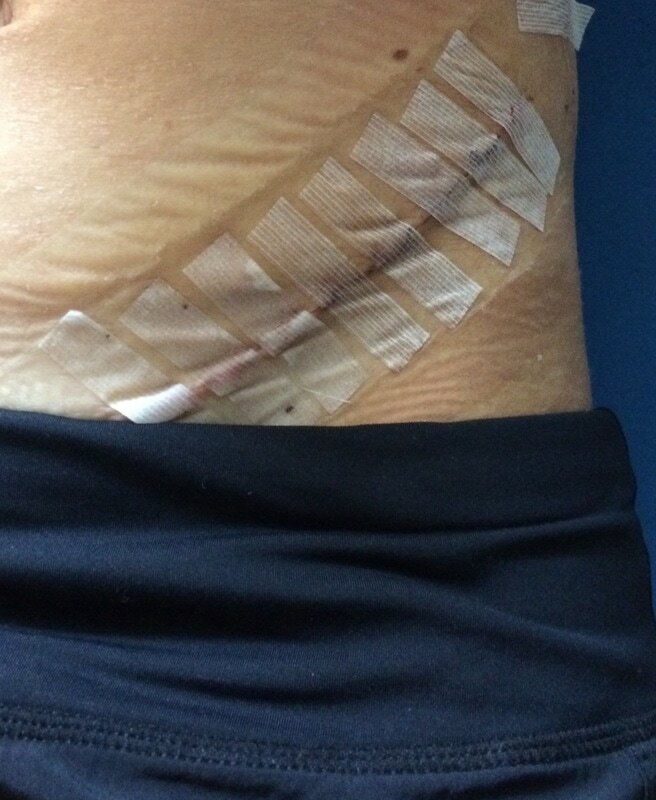 I went ahead with the surgery in March and a couple months post-op I got confirmation that the surgery didn't work. I would have to go back in again and be re cut right through my abdominal wall again plus this time also having a vein removed from my calf and inner thigh to patch the artery. I was pretty upset. And annoyed. Not only did I have to go through excruciating pain again, this would really cut into my Kona prep time. I had no other option though as the problem had now become worse than pre op. The artery was even narrower now with scar tissue restricting blood flow to my left leg even at rest. 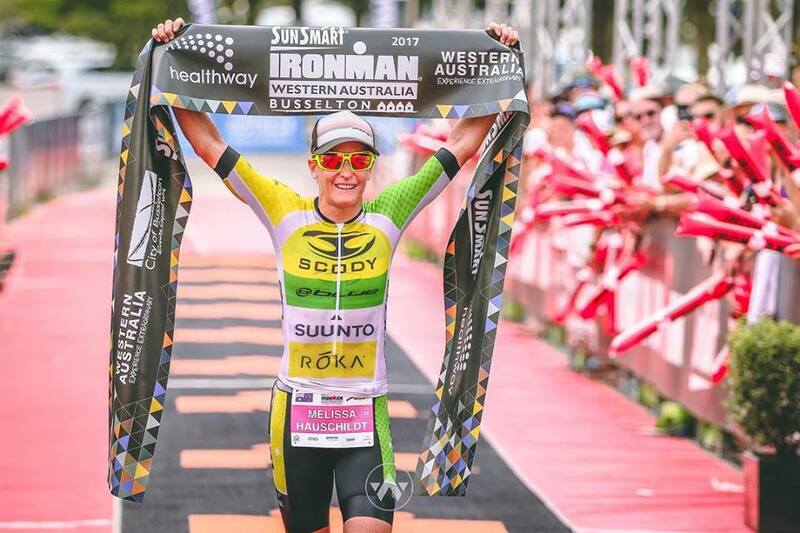 I did the calculations and thought I could still be ready for Kona with the ITU Long distance World Champs in Aug and the IM 70.3 World Champs two weeks later as my lead in races. 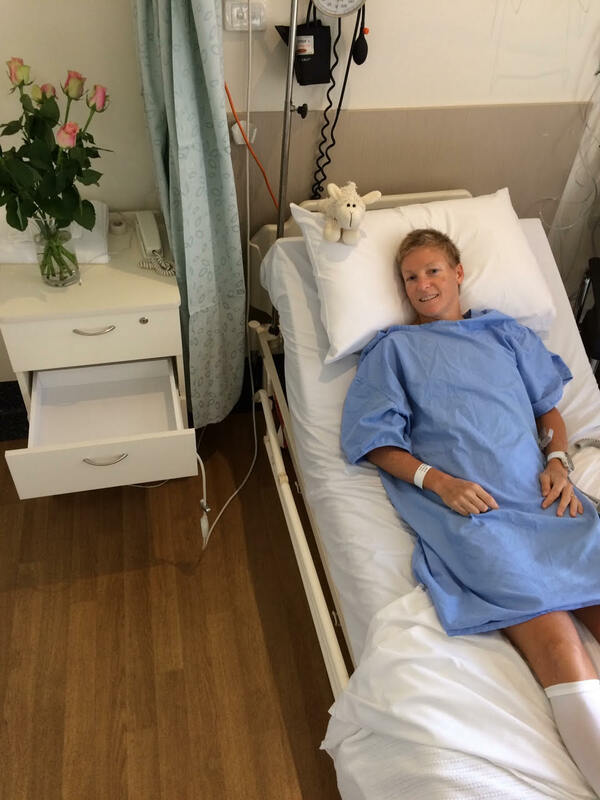 ​My first operation in March, 6 hrs after coming out, I was rushed back in as I had a blood vessel burst which was causing painful internal bleeding. Pretty unlucky the surgeon said. I thought I knew what I was in for by the second operation in June but I was thrown another curve ball which had me questioning if the universe was somehow trying to prevent me from racing this year. 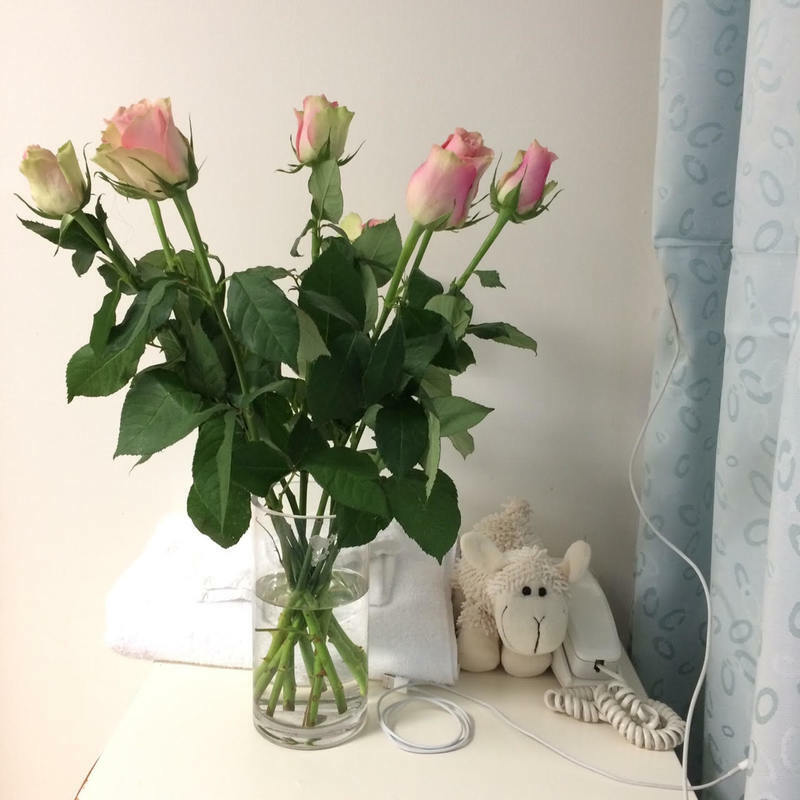 When I woke from the operation in June I knew something was not right. I couldn't move, I couldn't even open my eyes. And I felt really sick. I later found out that the 90minute operation actually took 4.5hrs. The surgeon had accidentally knicked the internal iliac artery which started spurting blood. He had to hold his finger on it to stop me from bleeding to death until help arrived 45min later. A lot of blood loss and a lot more anaesthetic meant my body was so weak that opening my eyes was a struggle. I lied there like a vegetable. I could hear but not move. After a day went by and four blood transfusions to keep me alive, I still didn't have the energy to hold a cup of water I was given. Unfortunately though, I was still loosing 100mL of blood an hour at two days post op. Waking after the last op was the worst feeling ever and I begged the surgeon to not cut me open again. He said he had too, there was no other option because I was still losing too much blood. As I was being wheeled back into theatre (for the four time) Jared said to me "your like a heavy weight boxer that just keeps getting knocked down, you just need to get up one more time". When I finally left the hospital, I looked like I'd had a fight with Wolverine with long slices all down my left side, but I knew nothing would be as hard as what I'd just been through. I now have a 20cm cut right through my stomach, 15cm down my inner thigh and 10cm down my calf. Battle scars I'll never forget. 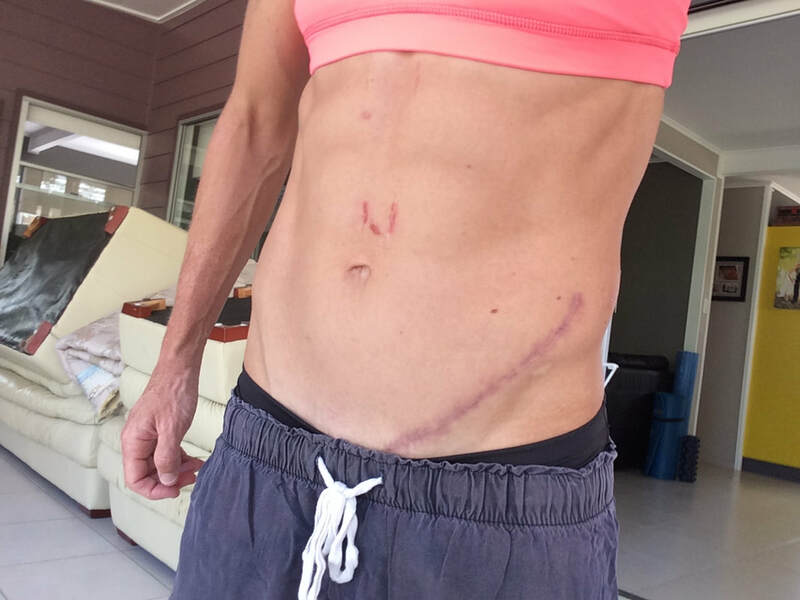 Top section of my abdominal scars. I did everything right to get myself strong so that I could hop on the plane and head to Boulder ASAP. 8 weeks the surgeon said before I could get back into decent swim, bike and run again. Two weeks post op I was doing very basic Core exercises with the muscles I had available with a tight corset holding my stomach in . Dry land paddle work before I could get in the water. Jared even had me doing simple muscle contractions of my quads and calfs when I was still in my hospital bed. I was taking iron to help replace the blood loss. Probiotics to offset the antibiotics and anaethetic. Jared's mum was amazing and made me Keffir, kombucha and bone broths to rid my body of the anaesthetic. I was going to be on the starting line in Kona. AND, I was going to cross the finish line! Training for Ironman World Champs. Photo by TriMag. ​It wasn't until my second wada drug test (since the June op) that we realized (we are able to check blood results online) that my blood count (haemoglobin and hematocrit levels) were still extremely low. 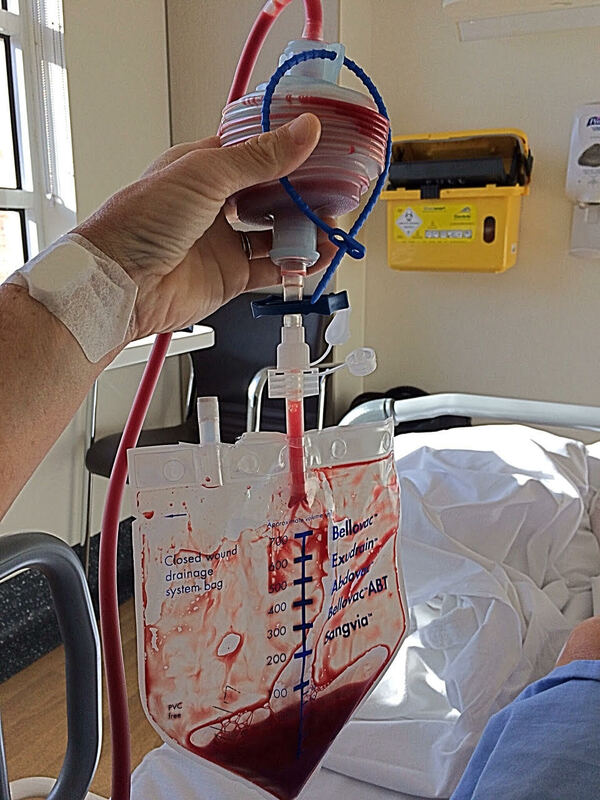 The blood transfusions were enough to allow me to walk and talk but not train for an Ironman. I stuck it out in Boulder, doing what I could, preparing as best I could, and then it was time. I needed to get in some races. The ITU long distance World champs in Penticton, Canada was first. Tuesday night, 5 days before race day I was up all night throwing up. Saturday, the night before the race I was also. I knew it wasn't food poisoning or a virus because this was not the first time since the op. I also threw up for no reason after the first op in March as well. Something to do with damaging nerve innovation to the intestines. During the ITU race I felt like a zombie. It was like I was watching from above, just "getting through". The last time I raced the ITU Ld world champs I won. This time I finished a disappointing 9th. 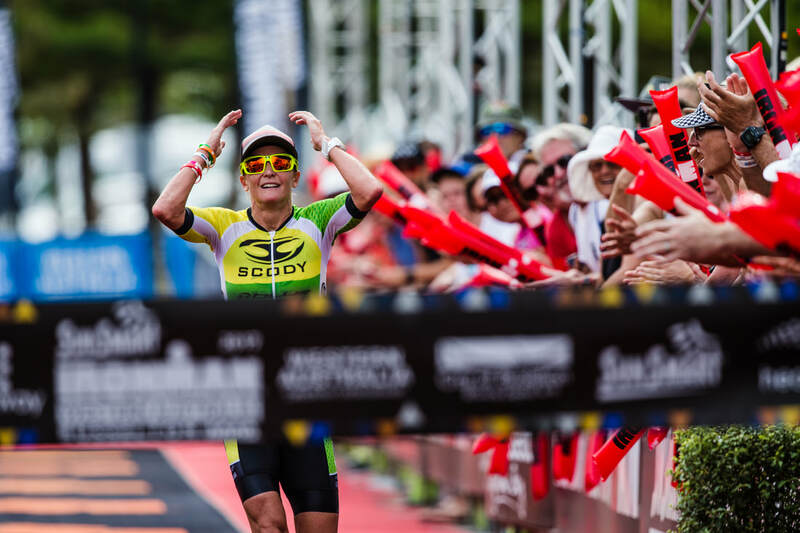 ​Two weeks later was the IM70.3 world champs in Chatanooga, Tennessee. I've won this race twice before and last year I came 2nd. I hoped this year I'd reclaim the world title. Instead of going back to Boulder between races I stayed down at sea level to hopefully absorb all the altitude work and help my body get its blood levels closer to normal. Race day was much better than Penticton. I felt human again. But I just wasn't fit enough. I finished 10th but my bike and run splits were in the ball park so I knew I'd made some improvement. 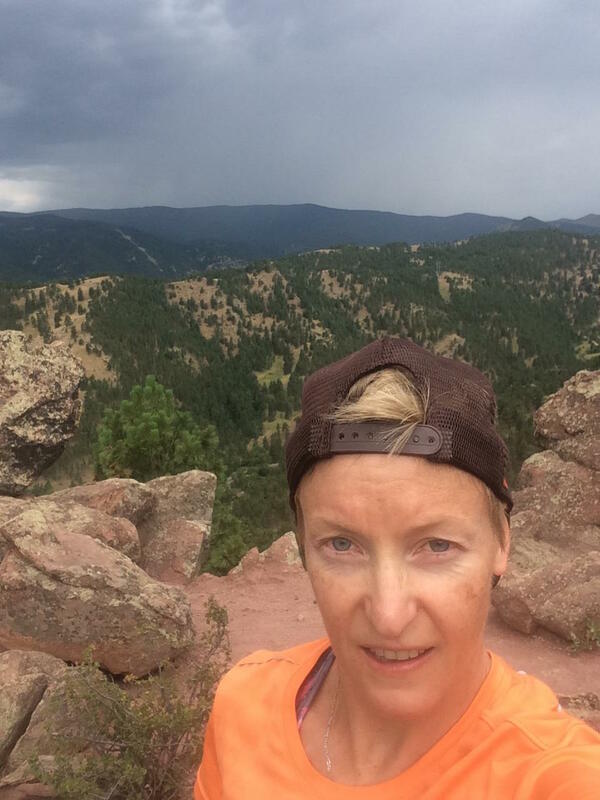 I went back to Boulder for three weeks after 70.3 Worlds. I got in some good sessions but I knew I was way off the fitness level I was last year. I stopped looking through my training diary and started working on my mental preparation. Time had run out and I had to start convincing myself I'd done enough. I was getting fitter & healthier but was I fit enough to beat the best in the world? 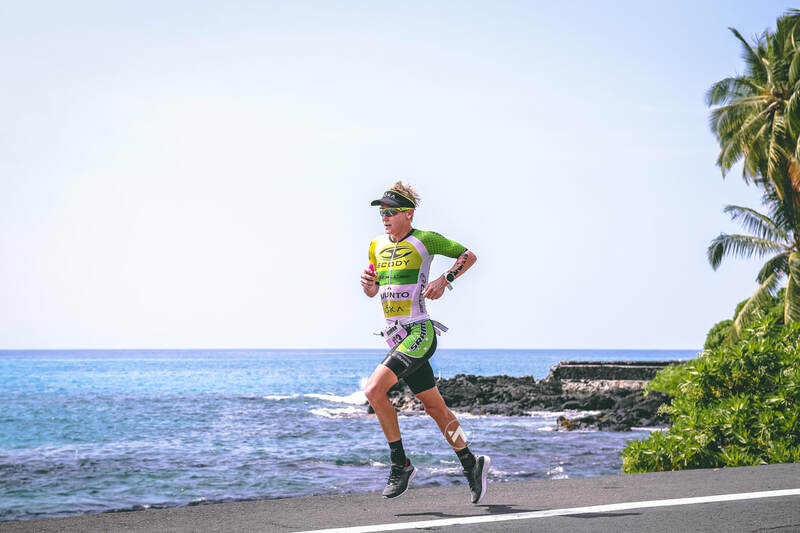 Two more drug tests in Kona, another 6 tubes of blood (as if I hadn't already lost enough) showed my blood count was getting closer to normal, but still not quiet there yet. Even though it still wasn't back up to normal it gave me promise that I was in much better condition than my previous races. Double the distance though, I had no idea what to expect. For the first time in my career I didn't know what I was capable of. Could I pull off the impossible? 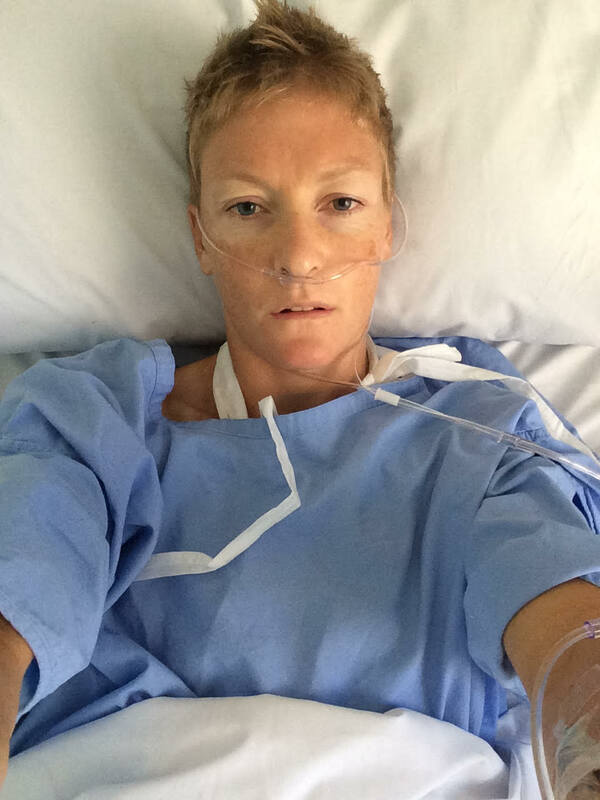 My surgeon said it'd be unlikely I'd be able to race an Ironman this year. I thought to myself, I'm different. I took my medal and my Hawaiian necklace, found a shady piece of grass and curled up in a ball to quietly escape the world. Not the result I wanted but it's given me massive motivation and drive to go back there next year, fit and healthy and show that island what I've really got. The exciting thing for me now at this point is that I've made it through the worst of it all. My health and fitness is improving week by week. I'm looking forward to getting closer to full speed in the next couple months... now that 'my season' is just starting to fire up. A massive thank you to all my friends, family, fans, followers and sponsors that have been behind me all year. Thank you for all the lovely messages. Can't wait to show what I can do with two fully functioning legs and normal blood levels in my systems! 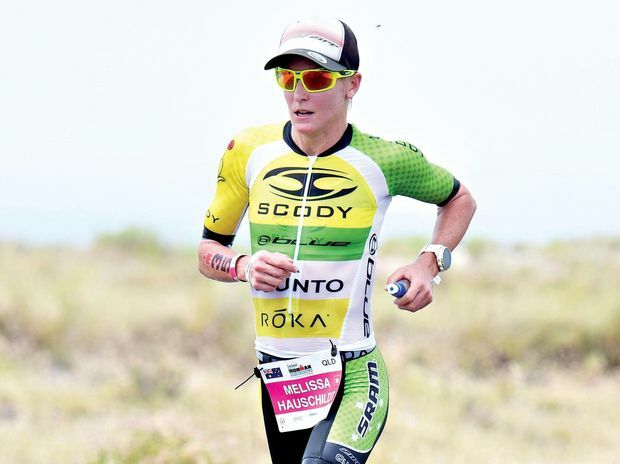 Last year I rocked up to Kona in the best shape of my life and was unaware I had this artery problem. 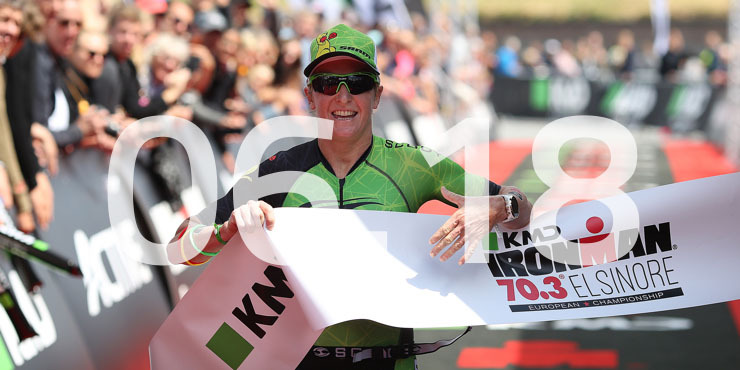 Looking back, I first experienced it in March 2015 during Melbourne Ironman but not knowing what it was or even exactly how to explain it I never told anyone except my husband. His initial reply was "it can't be too bad if you're still wining all your races and breaking bike course records" so I tried to forgot about it. In Kona however I pushed it further than before by staying in the TT position for longer than I ever have before and I ended up paying for it. I came away with a DNF after going in thinking I was fit, healthy and ready to have an amazing race. So as soon as I got home I explained all my symptoms to my doctor and began the investigations to get answers. 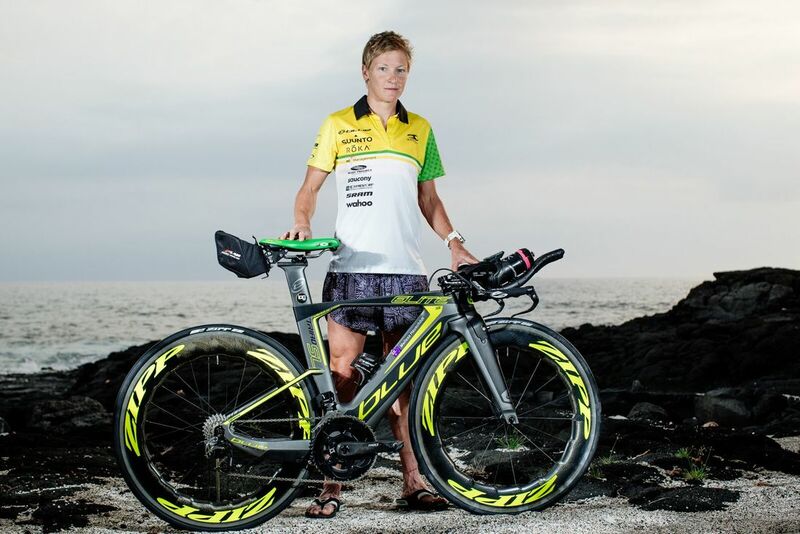 Less than 10km into the bike leg in Kona it began. It started off as usual with the feeling of a belt around my left thigh with someone gradually tightening the buckle until the quad was completely suffocating. I lost strength in the left leg and then when I kept pushing through the fatigue and pain, the VMO (medial side of the quad) started to tighten up like a deep cramp that was gonna tear the muscle if I didn't stop. I've had this before though, for two years now, but gradually getting worse so I knew it wasn't going to tear so I kept pushing on. In past races when it got too intense I'd sit up off my aero bars and massage it until I felt some relief. As the bike leg goes on I'd need to spend more and more time either sitting up or preferably out of my saddle. In Kona however I refused to get up. I wanted this race win more than any other so I told myself "stop being soft, stay down and push through it". Little did I know that sitting up was actually helping, it was opening the hip joint and un-kinking the artery to allow the blood to flow to my leg. 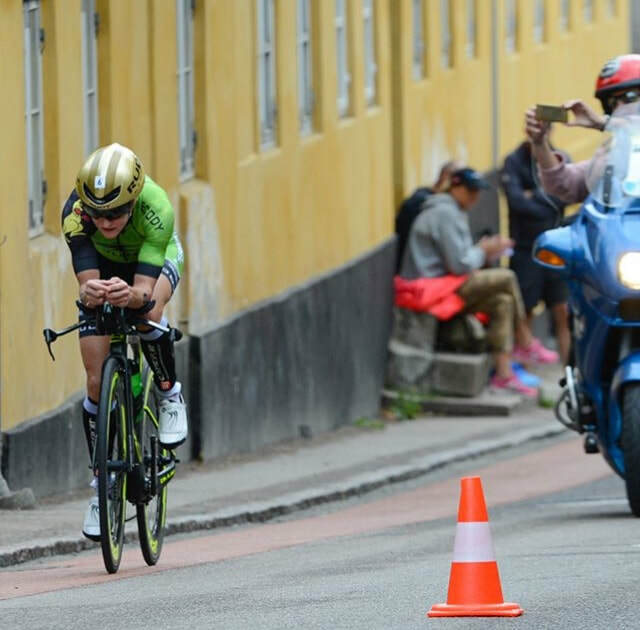 I should have realized that it was not just a coincidence that I did not get the symptoms on hilly bike courses when I wasn't in the TT position. 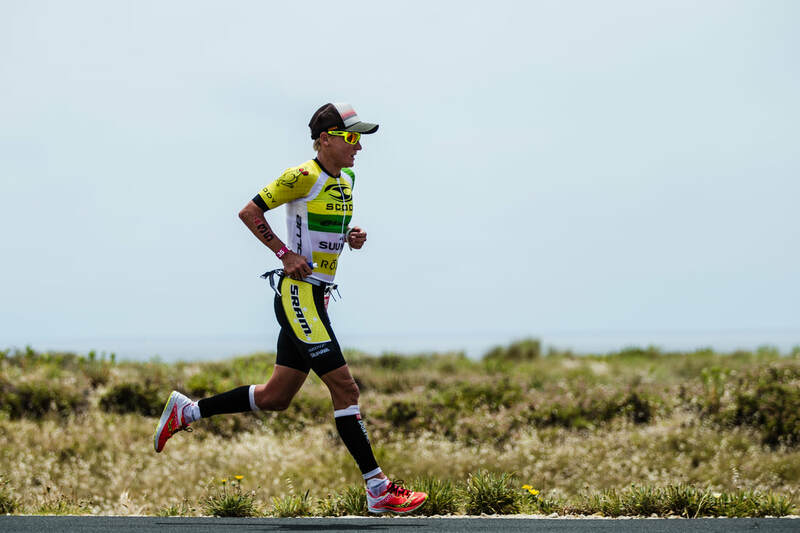 As Kona is not a real hilly course, by half way (90km) I was in serious trouble but my mind was in race mode and I just kept telling myself it'd be ok. I began to sit up to relieve it. I didn't want to but I had no choice as it turns out there just wasn't enough blood in my leg for it to work. ​I'd thought if I could get back to T2 I would be fine running. 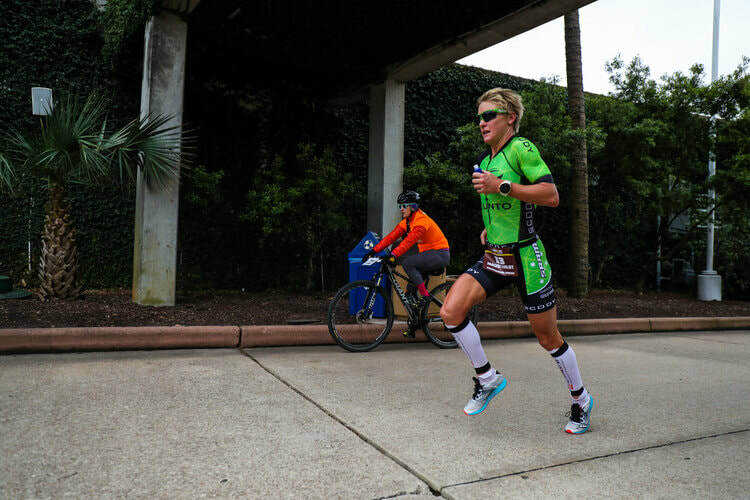 In past races, even when I'd pushed the leg pretty far on the bike, after a stretch and massage in T2 I've been able to run. By 130km it was touch and go whether I'd make it back. My left leg, no matter how much I told it to keep pedaling, was completely shot. I did get back to T2 on one leg and still thought I was in with a chance. I was telling myself it was just a cramp and took salt, gels, massaged the leg and eventually hobbled out onto the run course. Every step I felt like I was tearing the muscle but it would all be worth it to stand on the podium. Every few km I'd stop unable to bear the pain but telling myself to pull it together. By 12km the left quad had reached a point that I felt the damage was becoming too serious and I was sure it was about to tear off the bone It was so hard to do, but I stepped off the course. ​About 6hrs later, in the middle of the night I started experiencing pain like I've never felt before. I tried to tough it out but then I started furiously ringing my nurses call bell. I guess they get a lot of complaining patients wanting stronger pain medication so they gave me a neurofen and told me to relax. Half an hour later the pain was not easing, it was getting worse and I was almost ready to pack it in and say goodbye to the world. Something was not right but they just weren't listening and kept telling me to calm down. I started questioning my pain tolerance but after about half hour more, my body now shaking and for some strange reason my teeth/jaw chattering (I wasn't cold) I demanded the surgeon come back. When he arrived and saw the state I was in he said "this amount of pain isn't normal, she's got a bleed". What does that mean? I am gonna die? At that moment I'm pretty sure I wasn't too disappointed with the thought of dying. He seemed calm but explained that I had to go back in and get cut open again. Not cool man!!! At 3am on Wednesday I was back in theatre. When I came out the nurses were a little nicer this time round (but still wouldn't let me eat... 25hrs and counting...) and maybe a little too cautious. Every half hour without fail I had to get my temperature, HR and BP taken. With a resting HR of 25 and a nut case ironman athlete who willingly puts their self through pain on a regular basis they now realized I was a little different to my 87yo hospital mates. The second operation went well. By Saturday the surgeon was happy for me to leave the hospital but not quite ready to fly home. Another examination Monday and I had the all clear to fly home Tuesday afternoon. Yay, I'm going home. Maybe I was a little excited Tuesday morning cos I got thrown one more curve ball before leaving. ​I jumped out of bed, perhaps too quickly, and rushed down stairs to say goodbye to my friends' 9 year old daughter who was off to school for the day. I got three steps from the bottom when I was so dizzy that I knew I had to stop and sit down. I sat there holding on hoping I could keep it together. Next thing I found myself waking up on the ground at the bottom of the stairs in a pile of sweat. Who knows which way I fell but I felt sick when I woke up and had a sore head so I'm guessing maybe I dived down head first. Would love to see some footage of me playing rag doll 6 days after major surgery. So after a week in hell and a couple nights home in my own bed I'm happy to say I am recovering well. I wish people would stop telling me jokes and being funny cos I swear I almost burst a stitch last night. 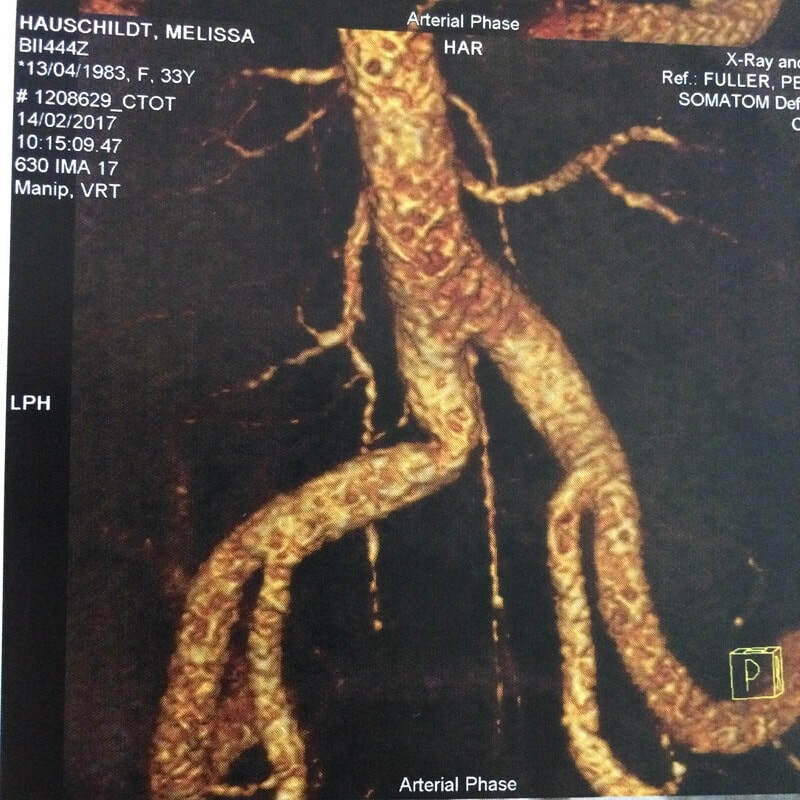 My doctor is very happy with my progress and says that not only will this fix the problem I get on my TT bike but should also help my running as the artery must have still been kinking to some degree with hip flexion when I ran. My recovery plan from surgery date is 2 weeks till swimming, 4 weeks till stationary biking and 6 weeks till running. I'm pretty excited about my future and I'm so thankful for all the tremendous support I've had this week from sponsors, friends and family. Kink will always be a reminder of this surgery! I didn't get the best start in the 3.8km swim but it was nothing to complain about. Three girls took off quick as we ran down the beach into the crystal clear (shark-infested) waters. As we got going I was too slow to get on their feet but I was happy swimming on my own and I felt like I was swimming well. After a couple hundred meters my goggles were too fogged to see, so I had to stop to clear them. I made my way out to the purple turn buoys at the far end of the jetty without spotting any sharks so that was a win! As I got around the end of the jetty and started heading back there was a lot of chop on the windward side but straight back following the jetty should be easy enough to sight. I was 50sec behind at this point and I tend to swim better in rougher conditions so I was confident I would start gaining time on them on the return trip. I put my head down and just swam straight, parallel to the jetty. That was until I spotted another purple "turn buoy" way off to the right. (Clear pre-race instructions were that purple coloured bouys on the course were "turn bouys" and must be kept on your left.) I stopped and started to panic while looking around for an official to ask if I was meant to go around that buoy, cos it wasn't close. I couldn't find anyone so I had to make a decision... head straight back, miss the buoy and risk getting DQ'd, or swim out to sea and potentially end up swimming a lot further. I had to take the second option so I put my head down, sprinted out to the buoy and then stopped... Now what? Do I stay out here or do I head back to the jetty? I was so confused as I couldn't see any other buoys. I headed back to the jetty but the whole rest of the swim I couldn't relax. I kept second guessing myself, stopping, swimming with my head up, trying to sight an official to ask if I continue straight back as I was. When I got closer to shore I spotted another purple buoy out to the right again so I started heading for it and then luckily saw a paddle boarder... I asked him about going around it and he said "no, go straight back". When I finally got my feet on the sand I was sure I was going to get the sympathy clap for last out of the water. As I ran to T2 I heard I was 4th out of the water... That told me at least one of the girls ahead didn't do the course I did as I passed one of the three on my way back before taking my detour. 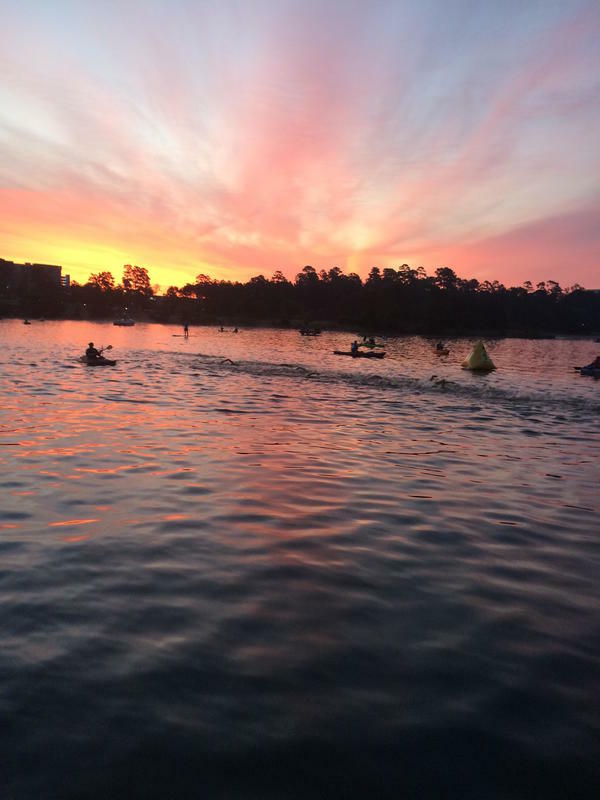 I was frustrated with my swim but I still wasn't sure if I was the only one to do the full course or the only one to do extra. 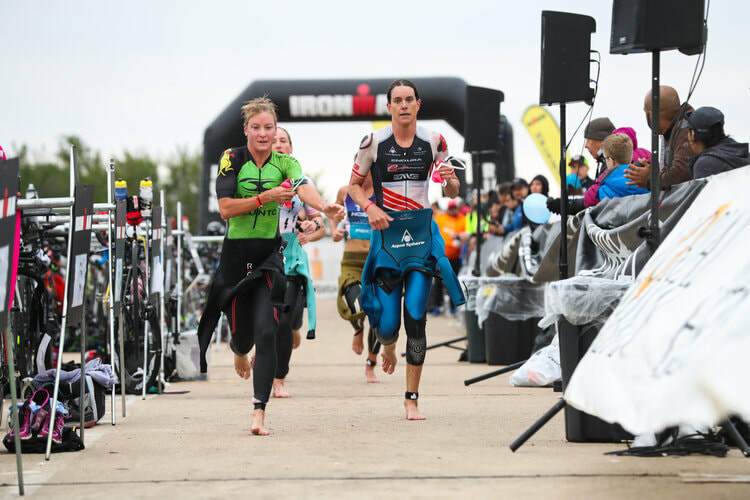 I did find out after the race those extra turn buoys we're "accidentally" left out from the 70.3 course earlier in the morning and were immediately removed from the course after a pro athlete was seen going around them. I tried to forget about my swim and just get on with my race. It's a long day and things can go wrong, you've just got to roll with the punches. ​On the bike I knew I had to be conservative. I'm getting getting closer to confirming diagnosis on my quad problem that effected my Kona race. Now that this Ironman WA (and my Kona qualification) is complete I can go ahead and have the problem fixed. 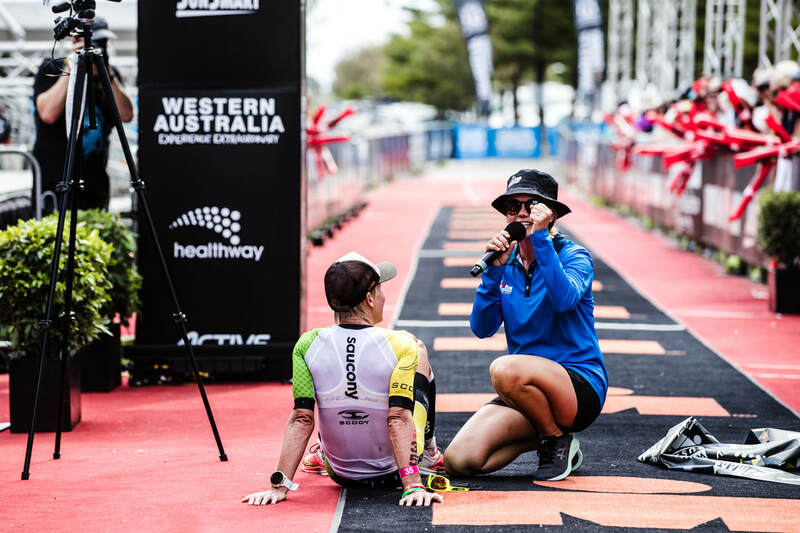 In the mean-time, leading up to Ironman WA and for the race itself I had a few techniques that I used throughout the race to manage the problem and keep the quad pain at bay a little better. 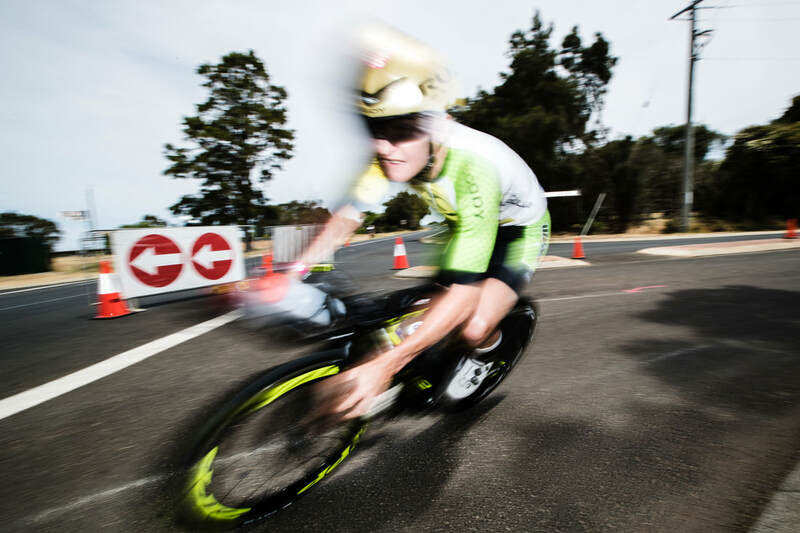 Busselton bike course is dead flat! But, there are 6 sharp u-turn on each of the two laps so every one of them I stood up for a couple of minutes at a time, then sat down and massaged my quad before getting back down aero. I did the same at other 90degree turns and the same through all aide stations. As long as I didnt push it too hard and regularly opened my hip up, I could keep in under control and still run on it fine afterwards. I took the lead early into the bike leg and maintained a 4-plus minuted lead over the other girls. 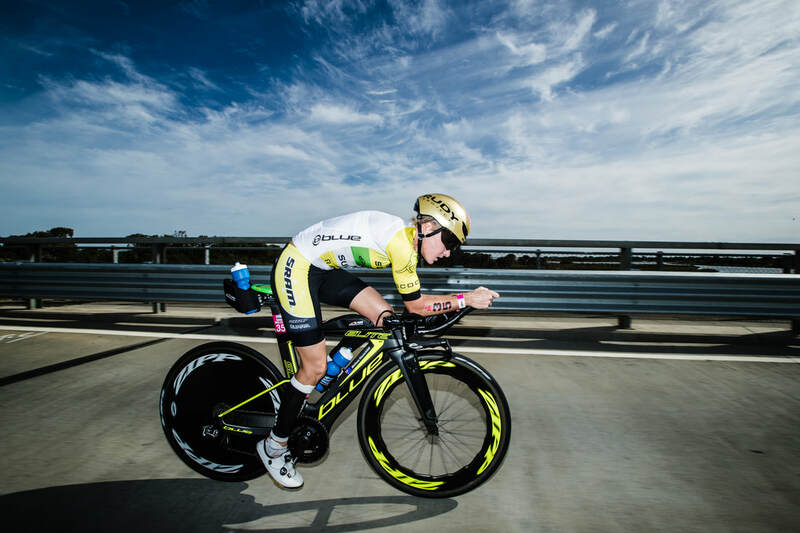 The excpeption was with Mareen Hufe who took off like a rocket in the last quarter of the bike. She caught me and went a couple minutes further up the road by T2. I kept composed and didn't attempt to even go with her as my leg was clearly calling the shots and I had to listen. I got off the bike and walked right through transition massaging my leg on the way then tried to quickly stretch out the quad and hip flexors. As I pulled my heel up to my bum my hammy cramped. Hmm, never had a hammy cramp before. I quickly dropped it back down... Ok, we don't need to stretch that any more, I'm all good. As I ran out I heard I was 2:30 down on Mareen. Yep, she destroyed that bike course! But I had a good 6minutes buffer on Sarah and Asa. I was still in a good spot. I got my running legs pretty quick and took over the lead at 8km. My left quad and VMO was good. I got through all my nutrition on the bike. I was in the lead and I was now on my best leg - the run! I was happy! 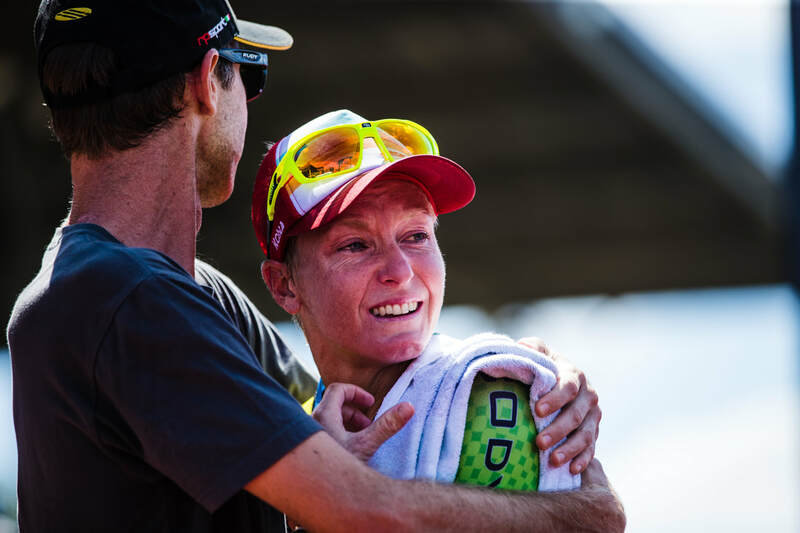 ​The run was going well, I tried to stay relaxed and not push it, to make sure my lack of training leading into the race didn't come back to bite me. The only thing that gave me trouble during the run was the hammy cramps. My hammys started twichting funny again like they did in T2 at 24k's into the run. When I got to the next aid station I asked for salt just incase the funny twitching might start being not-so-funny if it continued. Instead of salt, what I got was a jar of vegemite! Now I know this is very un-Australian but... VEGEMITE! Omg, that stuff is terrible! I looked down at it then looked over to my lead cyclist and he gave me the nod of "it's the only thing that'll get you through". I swirled it around my mouth while screwing up my face in disgust. It was horrible. My lead cyclist and I shared a little laugh as the twitches subsided for a bit. Not for long enough though... The next cramp was like a whip to my hammy and it stopped me dead in my tracks. I heard the lead bike guy skid to a stop right behind my bum too. Poor guy hanging off the front of his handlebars. I couldn't move. I let a few nasty words fly as the awesome spectators tried to mentally help me get going again. Once it passed I took off and made my way from aid station to aid station sculling electorates and munching on vegemite just in case it might help. I must have got struck down over half a dozen times in the last 18km and there was nothing I could do but wait for it to pass. The worst one was at about 32km right in front of the best cheer squad on course. There was a dressed up cow, a clown, people with undies on the outside of their pants and a tonne of lovely helpful Aussies screaming like crazy, willing me to push on. It was also about 10m from an aid station where that now yummy vegemite was calling my name. As I stood their frozen for what felt like eternity I was willing my arms to turn into inspector gadget as I tried to reach out and grab the vegemite off the table. My lead to Mareen hovered around 3mins depending on if I was standing around waiting or if I was off running. The last 6km was one of the most nerve racking 6km of my life. I'd been out there for so long and I was so close to finishing and everything else was feeling fine but I just didn't know when I'd have to completely stop at unpredictable moments and for unkown lengths of time... I was on a mission that last 6km. No sharp turns, no quick movements and definitely no side stepping people that got in my way... sorry to the poor man I ploughed straight through with a couple km to go. Finally I got to the M-dot finish carpet and then turned the corner to where I could see the finish banner... and they could see me. I knew I couldn't let my guard till I crossed the line but I guess I just got a little too excited... I gave a couple of high fives and then my hammy just took the grip of death, locking my knee and hip in place. How embarrassing, the commentators getting excited over the loudspeakers for a new course record, the crowd all chearing, while I move just a few meters... then wait... move a few meters... then wait. It was a rediculously comical situation. The least I could do was acknowledge the spectators with some slow-mo high-fives while I'm trapped there on the spot. Just like a good dream going bad. I could see the banner a few meters ahead and was starting to wonder if I waited here long enough, if Mareen would eventually just run on by for the win. Thanks to crowd getting louder and louder at me, willing me to make it, I finally walked across the line and grabbed the banner. Held it up and gritted my teeth to something that resembled a smile then lied down for a minute or so till the cramp subsided again. Once that was gone I was able to jog back down the finish chute and thank the amazing crowd... like as if nothing had happened. Mission complete! Ironman win, course record, Kona qualification, mental training to the max and now plenty of time to get the treatment right and fix this leg issue for good. Happy holidays and thank you to everyone that supported me on the weekend. It really makes a massive difference. Ahhh, it feels good to be back racing for a world title again. It's been a while between drinks. Although I'm very grateful to be in this position again, I'm not going to lie and say I'm 'happy' with a 2nd place finish (as I'm sure would be the case with most of the top contenders who believed they could win). 'Satisfied' maybe, but 1st is what I had my sights set on. I've collected 3 'championship race' wins this year (Aus 70.3, Euro 70.3 and Euro IM) and I thought it would be well within my capabilities to win this one too given my current fitness. However, as hard as I tried, I just couldn't match Holly on the day. She built up too much of a lead on the swim and bike for me to claw back in the end. 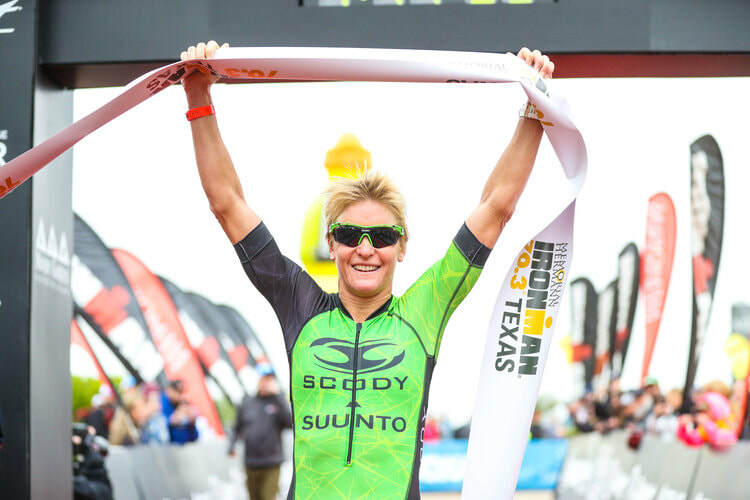 It was a gutsy and impressive way for her to race and it paid off big for her in the end. My day started off as most 70.3's do... thrashing around in the water for about half an hour trying desperately to locate the swim exit. After about 100m I couldn't tell you where the rest of the ladies went. I couldn't tell you where I went for that matter. But I can tell you that I didn't see the others again till we hit dry land. They could've all swum straight to the beach and sat there waiting for half an hr pointing and laughing at me swimming on my own for all I know. I never watch the race coverage back again post race so I'll never know for sure. But I'm glad to say I did eventually find my way out the water, across the beach, through the sand, up the stairs, around the loo-with-a-view, along Beach Terrace, past the age group transition area, around the corner, onto the road and up the the little hill straight into the pro transition area about 162km from swim exit. It's here were I took a seat on the fancy black Ironman carpet in front of 'Froggy', my custom-painted, bright green, seizure-inducing Shiv. Removed my wetsuit, grabbed my helmet and said to Froggy 'let's roll!' At this point I was in 17th place, 3:52min behind the leader. It's no secret I typically come out of the water behind the pack, but 4min behind after the swim is a bad day even for me! Out onto the road, the first 50k or so of the bike was flat and smooth highway roads. I was actually pretty chilly for the first 20k and my legs were having a hard time warming up. 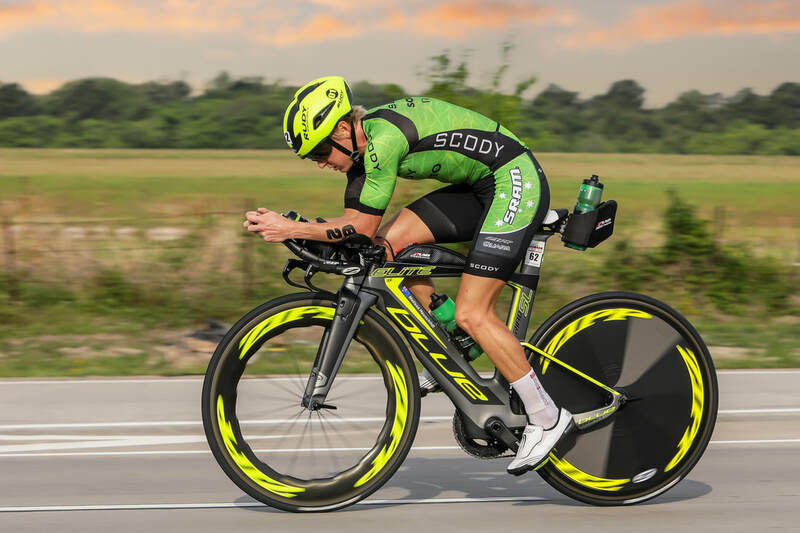 They gradually started feeling better as I continued, but I was still very conscious to stay conservative for the first half of the bike leg so I could really hit the hilly sections hard towards the end. I was getting mixed splits called out to me throughout the bike leg. It was pretty confusing and I couldn't get a grasp on what was really happening up ahead in the women's race. I eventually figured out towards the end of the bike leg, that I had been getting mostly splits for me to the 'lead pack'. This was good news at the time because the split was gradually getting smaller and smaller. But every once in a while I would here a split that stayed constant at about 4min. When I eventually caught the main pack at the 70k mark I realised that the '4min' split was actually the split to Holly Lawrence, the leader, waaaay ahead of the main pack. When I caught the main pack, I spent a few k's riding at the back weighing up my options. I counted 8 women in the pack. Pretty big pack for me to negotiate. 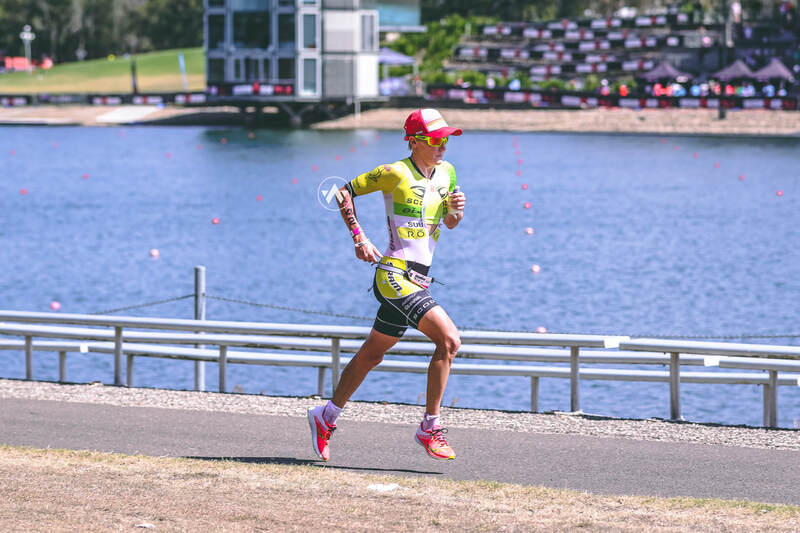 On the one hand I was at the point in the race where I wanted to hit it hard back to T2 and continue my own race plan. But to do this I would have to try overtake all 8 women at one time and risk getting a 5min penalty if I couldn't make the pass (passing one at a time is not allowed). My other option would be to sit in and trust that whoever was at the front of the pack was pushing hard to keep a good pace. 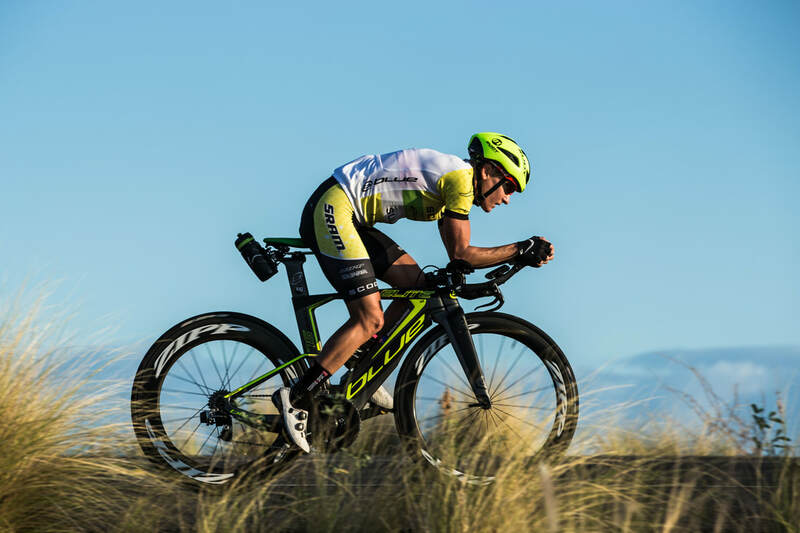 I figured they would be pushing hard at the front, but I couldn't tell what effort we were really pushing as a group while at the back because it felt to me like I was constantly soft peddling or coasting. Every few k's I would tell myself, yep it's time to make the move and continue racing again. But then I would look across to the draft official and second guess my decision, saying 'can you really push hard enough for long enough to pass the whole pack in one go... and then have enough energy to continue on the front after that?'. My answer kept coming back as 'I can possibly run down 4minutes but 9minutes would definitely put me out of contention for the win, but if I do make the pass I could reduce me deficit to 3minutes'. Yep, I didn't know what to do. As it turned out I was regretting my decision to play it safe once I got back to T2 and heard I'd lost an extra minute in the last 20k to Holly up the road. When I jumped off Froggy at the dismount line I was now in 6th place, 5:16min behind Holly. I ran Froggy from the dismount line, around a couple corners, past the loo-with-a-view, along Beach Terrace, past the age group transition area, around the corner, onto the road and up the little hill straight into the pro transition area about 432k from the end of the bike leg. Said 'good job Froggy, gotta go! ', whipped on my Kinvara's and race belt and started running. The run course took us out of transition, up Alex hill, down the other side and then dead flat 5k out, 5k back, over Alex hill again, and repeat for 2 laps. I tried not to let myself think the gap to the leader was insurmountable. I just kept chipping away hoping it was still possible to achieve my goal, win the race, have a burger and eat some chocolate cake. For the next 21.1k I had the most spectator support I have ever had in a triathlon. It was a bit like competing in the Comm Games in my home country and every time I would hit the lead, 100,000 people in the stadium would erupt like it was the best day of their lives! But this support in Mooloolaba was more personal. The entire run course, people would yell and scream in-depth encouragement, give me splits, advice, weather updates, everything! So many people were pouring their heart and souls into cheering for me. So many people I knew were constantly popping up along every possible stretch of road. For every person I heard and saw I wanted to win it for them just as much as for myself. I am so genuinely thankful to everyone of you for your incredible support. It was like nothing I've experienced before. I hope I can get around to thanking every one of you personally. You all lifted me along the whole way. The deficit to Holly was slowly coming down as the k's went on, but it wasn't happening fast enough. There just weren't enough k's in the run leg for me to catch back up. In the end I crossed the line in 2nd, 1:57min behind Holly. Like I said, grateful to be fighting for a win on the world stage again... but disappointed at not reaching my goal. Holly just got it all right on the day. She had an impressive race out the front all day and never looked back. And when I hugged her at the end she was rightfully over the moon and fresh as a daisy. Heather Wurtele came in for 3rd, followed by Daniela Ryf and Caroline Steffen to round out the top 5. At the finish line I found my family waiting for me. My parents and brother and sister and their families, and uncle and aunties... everyone was there. I'm so happy they could be there to watch. 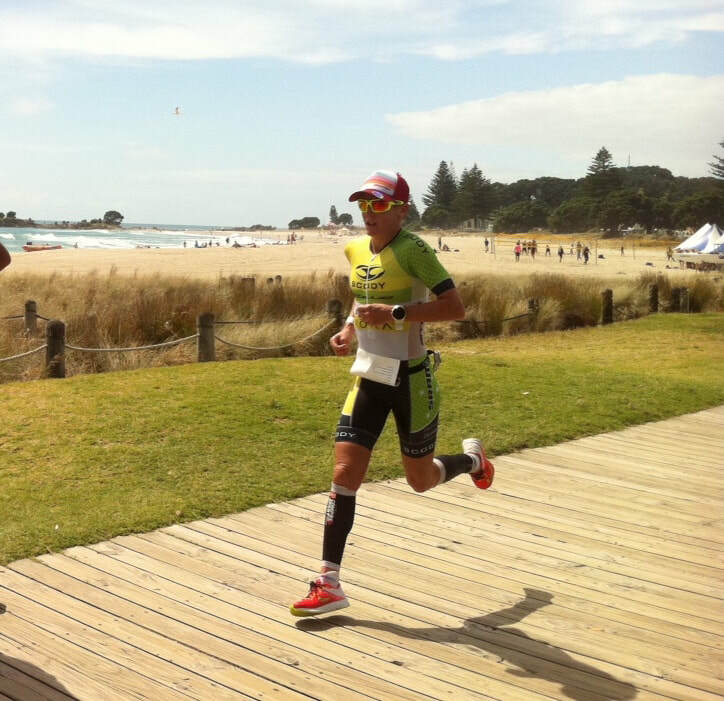 Great job to Ironman and to the Sunny Coast community for making the event a success. They put on a seamless event in the most beautiful place in the world if you ask me.